On the 8th of March 2016, H.E. 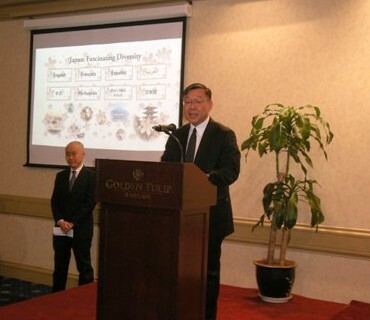 Mr. Kiyoshi Asako, Ambassador of Japan to the Kingdom of Bahrain made a speech on the bilateral economic relationship between Japan and Bahrain for Bahrain-Japan Business and Friendship Society (BJBFS). During his speech, Mr. Kiyoshi Asako explained that recent trade figures has maintained a stable level despite many difficulties faced by the world economy. Furthermore, he introduced governmental economic cooperation and the situation of Japanese companies in Bahrain, stressing that Japan will continue to contribute to the Middle East, which is an important supplier of energy for Japan. Besides BJBFS members, the event was attended by Bahraini governmental officials and businesspersons, who exchanged opinions on the ways of boosting bilateral relationship. 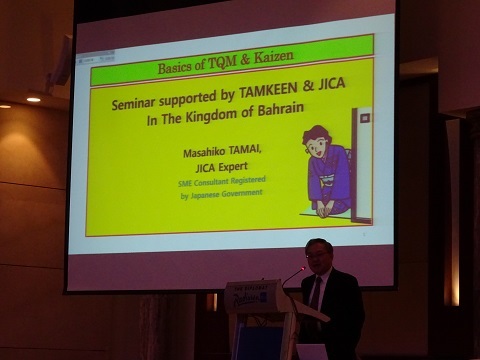 On the 31st of January 2016, Japan International Cooperation Agency (JICA) and Tamkeen held a "KAIZEN Workshop", as H.E. 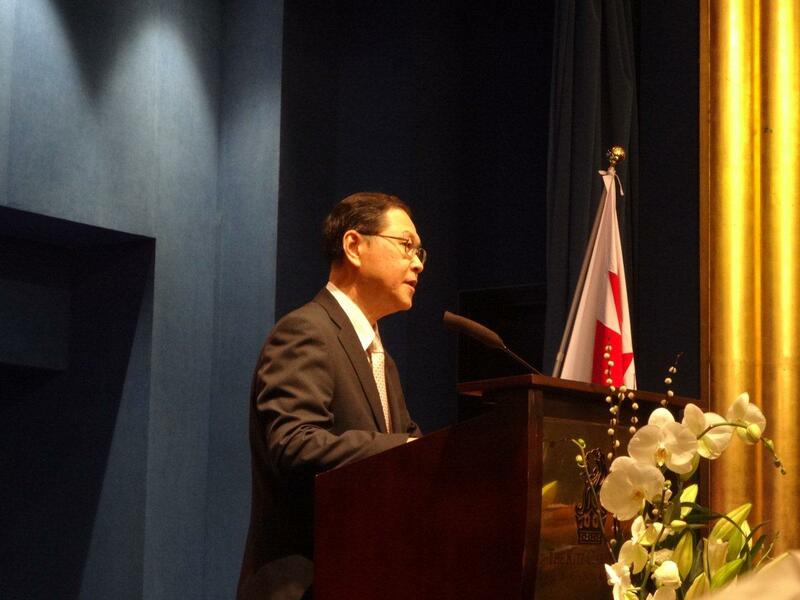 Mr. Kiyoshi Asako, Ambassador of Japan to the Kingdom of Bahrain made an opening speech. Bahrain, led by Tamkeen, has been focusing on the development of Small and Medium Enterprises (SMEs). And in that context, Tamkeen has joined hands with JICA and JICA dispatched a KAIZEN expert, Mr. Masahiko Tamai, to launch the KAIZEN workshop. ("KAIZEN" is a famous Japanese word meaning "Improvement".) Accordingly, KAIZEN expert visited 3 SMEs that were selected by Tamkeen to receive KAIZEN consulting. 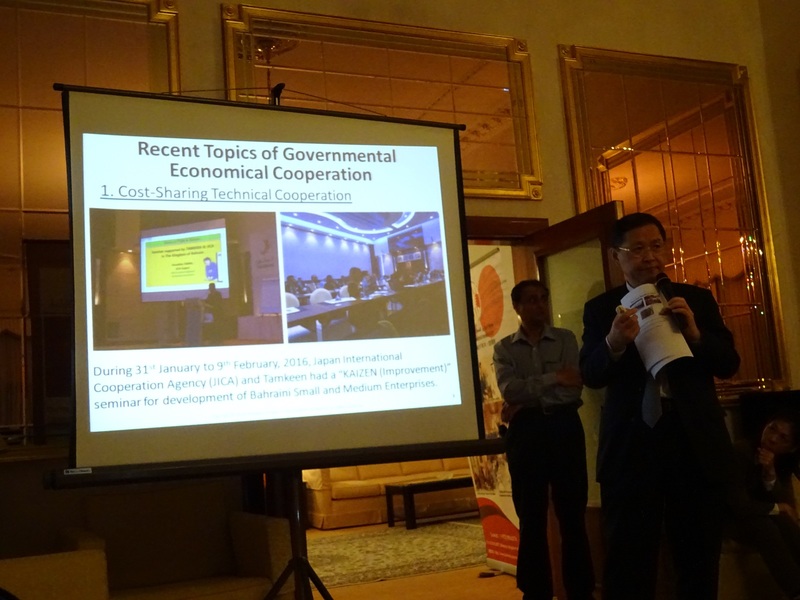 It is worth mentioning that this workshop was held in accordance with the scheme of Cost-Sharing Technical Cooperation that was suggested by the Japanese Government in 2013 for ODA (Official Development Assistance) graduate countries, and a new economic relationship was developed with Bahrain. On the 9th of December 2015, H.E. Mr. Kiyoshi Asako, Ambassador of Japan to the Kingdom of Bahrain hosted a reception to celebrate His Majesty the Emperor's 82nd Birthday. Around 300 distinguish guests including H.H. Shaikh Salman bin Khalifa Al Khalifa, Advisor of H.R.H. Prime Minister Prince Khalifa bin Salman Al Khalifa and other Bahraini royal family, government officials, ambassadors to the Kingdom of Bahrain, dignitaries of various sectors of Bahrain and representatives of Japanese companies gathered to celebrate the upcoming birthday of His Majesty the Emperor on December 23rd. 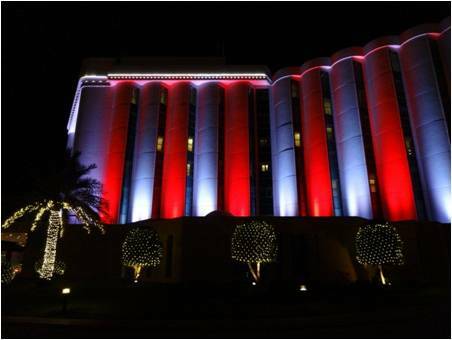 Ritz Carlton Hotel was decorated the colors of red and white for Bahraini and Japanese flags. The guests enjoyed Japanese dishes such as sushi, tempra and Japanese sake. Japanese cars were displayed in front of the venue. 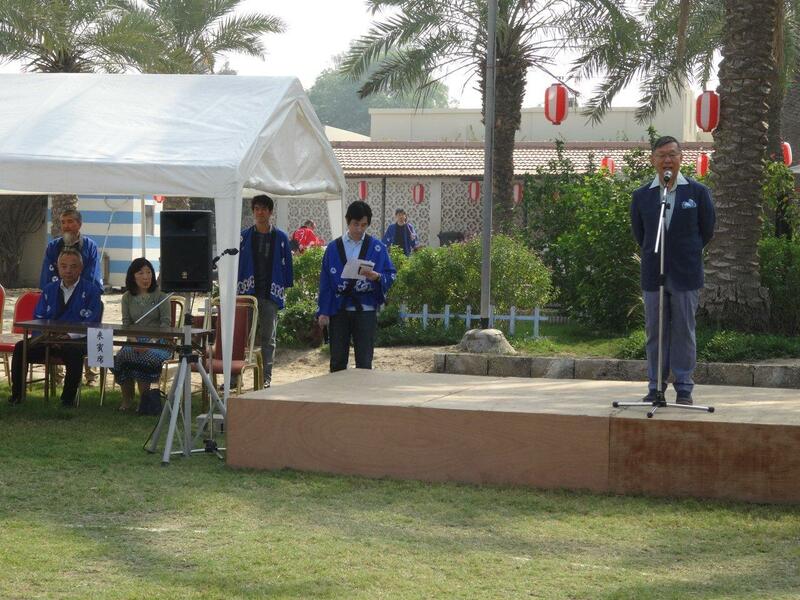 On the 4th of December 2015, the annual Aki Matsuri (Autumn Festival) was held by the Japanese Society in Bahrain at the Japanese School in Saar. 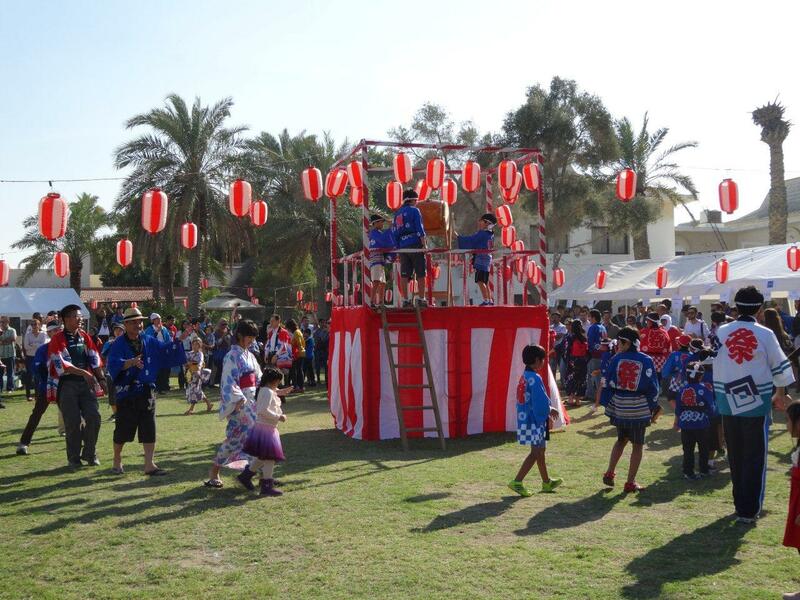 Japanese companies in Bahrain and the Japanese School ran Japanese food booths, performances and functions such as traditional festival dance (Bon-Odori) while the Embassy ran a curry booth and a ring-toss game booth. 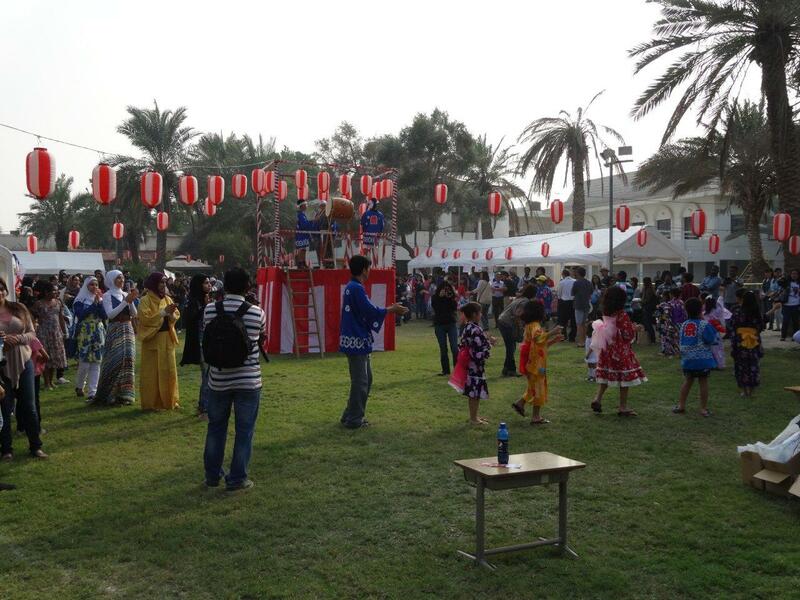 A lot of Japanese and Bahraini joined and enjoyed the Japanese festival atmosphere. On the 17th, BCCI hosted a bilateral business event with Japanese Delegation. During the event, the Ambassador talked about the business competitiveness of Bahrain and the attractiveness of GCC markets, and affirmed the high quality and reliability of Japanese companies and products. At the end, the Ambassador stressed the event contribution in developing bilateral business relationship between two nations. 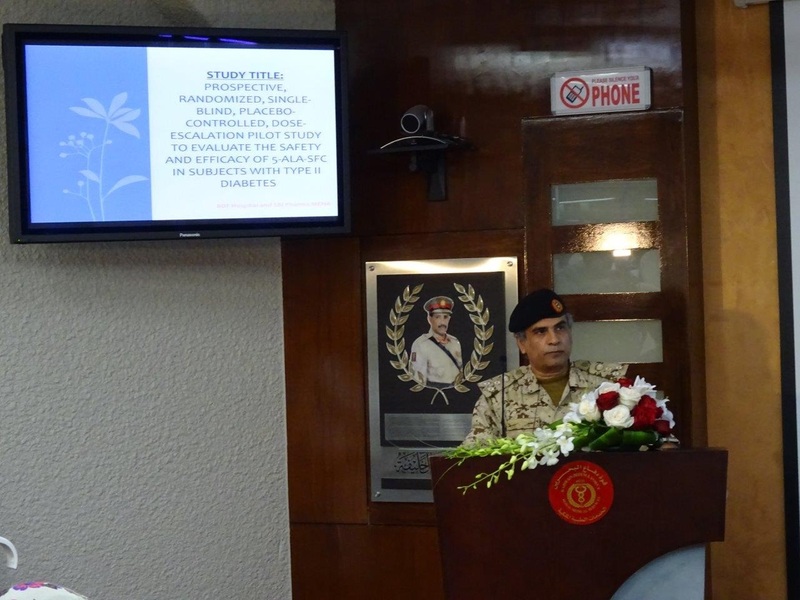 On the 1st of November 2015, a press conference about "the Pilot Study to Evaluate the Safety and Efficacy of 5-ALA-SFC in Subject with Type II Diabetes" was held by Bahrain Defense Force (BDF) Hospital and SBI Pharma at BDF Hospital. H.E. 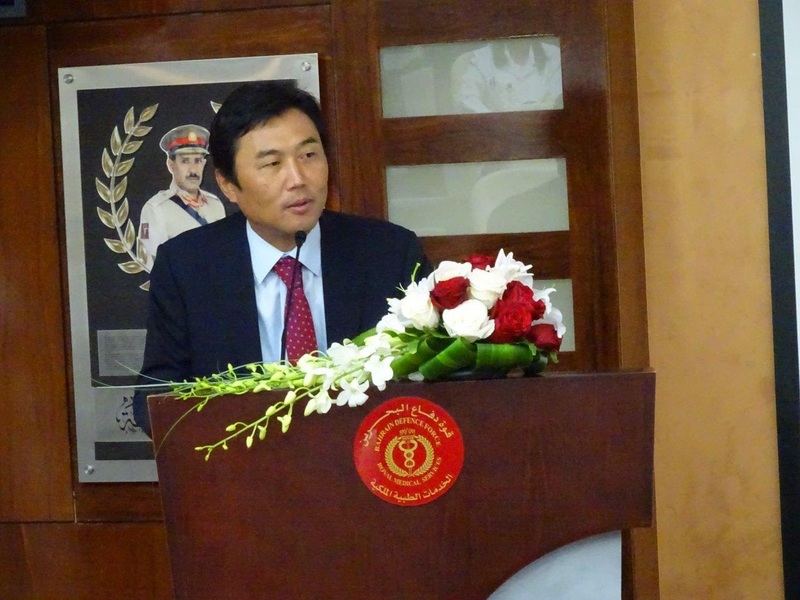 Mr. Kiyoshi Asako, Ambassador of Japan to the Kingdom of Bahrain attended the press Conference. This pilot study has started with signing MOU in April 2012, when His Majesty King Hamad bin Isa Al Khalifa, the King of Bahrain visited Japan. During the press conference, the Ambassador congratulated both parties on the success of the pilot study, which was the fruition of the MOU in 2012 to some extent; he expressed as well his wishes to contribute to the development and enhancement of the strong Bahraini-Japanese relationship in the medical sector continuously. On the 2nd of July 2015, H.E. Mr. Kiyoshi Asako, Ambassador of Japan honored a contribution by Ms. Fatima Al Khatib who had been served in the Embassy of Japan over 25 years and held conferment ceremony. Ms. Fatima was decorated with Order of the Sacred Treasure, Silver Rays. In this ceremony, H.E. Dr. Dhafer Alumran, Assistant Undersecretary for GCC & Western Countries Affairs, Ministry of Foreign Affiars of Bahrain attended and local newspapers reported her decoration. On the 17th of May 2015, H.E. Mr. Kiyoshi Asako, Ambassador of Japan to the Kingdom of Bahrain received at his residence members of Bahrain Japan Business Friendship Society (BJBFS). 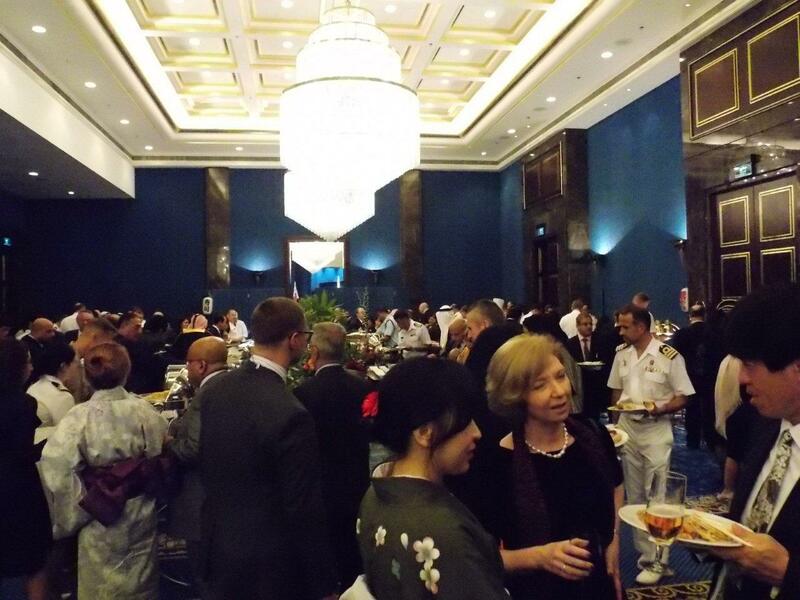 Around 20 guests attended the reception including H.E. Mr. Karim Al Shakar, Former Undersecretary for International Relations at Ministry of Foreign Affairs in Bahrain (MOFA), H.E. Amb. Dr. Dhafer Al Umran, Assistant Undersecretary for GCC & Western Countries Affairs, in MOFA in Bahrain, Mr. Mubarak Jassim Kanoo, President of BJBFS. 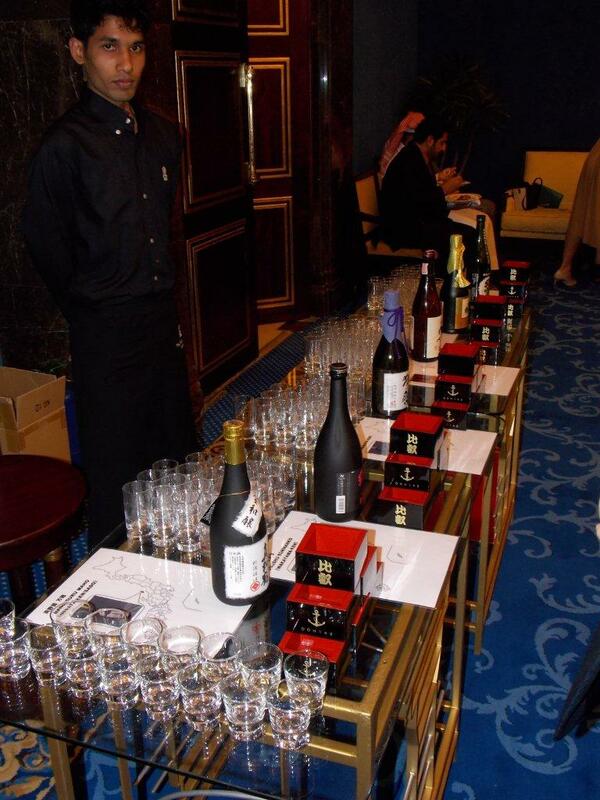 This reception aimed to stimulate the relations between Japanese & Bahraini Companies in Bahrain. On May 5, 2015, Mr.Uto and Mr.Ishikawa talked with Field Marshal, Sheikh Khalifa, Commander-in-Chief of BDF on defense cooperation between the two countreis, and both Vice-Ministers also discussed bilateral cooperation with H.E.Sheikh Hussam, Head of Prime Minister Court. Mr. Uto and Mr. Ishikawa visited Ministry of Foreign Affairs of the Kingdom of Bahrain and had a meeting with Dr. Dhafer Umuran, Assistant undersecretary for GCC & Western Affairs and Sheikha Rana, Assistant Undersecretary for Arab Afroasia & International Organization Affairs. 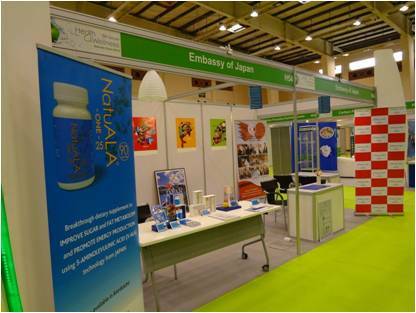 The Embassy of Japan has participated in "The 7th Annual Food & Hospitality Expo, 2015" and "The 5th Annual Health & Wellness Expo, 2015", which were held simultaneously from April 28 to 30, 2015 at Bahrain International Exhibition and Convention Centre. 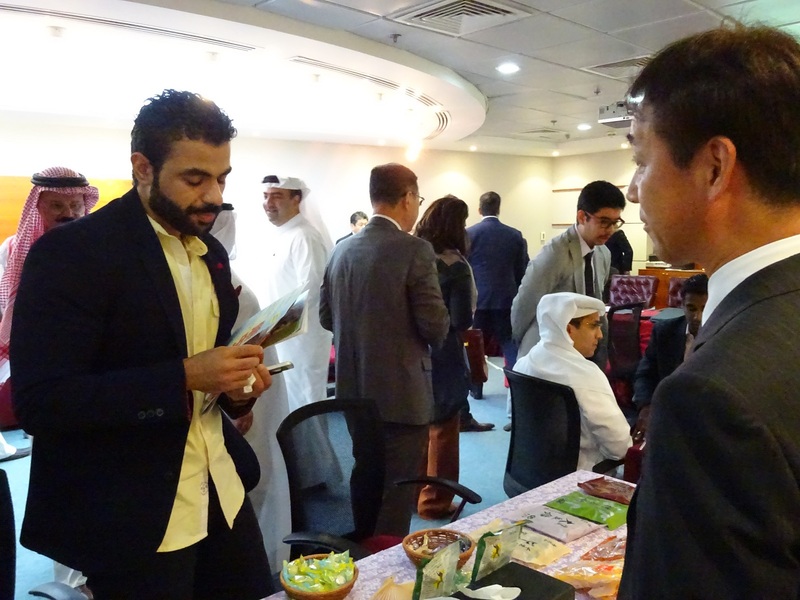 In cooperation with Japanese companies, samples of Japnese foodstuffs, food supplements, health products and cosmetics were presented by the Embassy along with publications and materials about Japanese cuisine and Japanese food companies. The samples of Japanese traditional snacks and healthy food were so popular and admired by a lot of visitors! 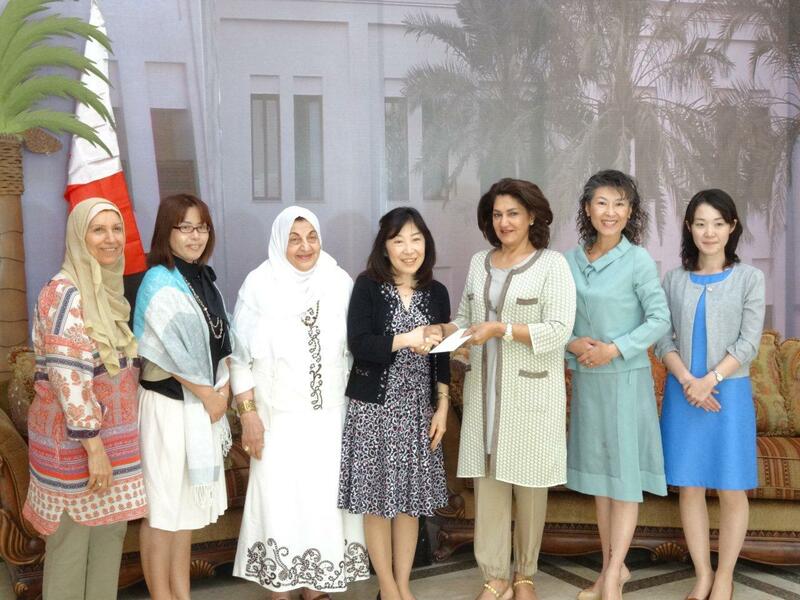 On the 1st of April 2015, Mrs. Yukiko Yamamoto, the wife of Deputy Chief of Mission at the Embassy of Japan in the Kingdom of Bahrain, accompanied with the wife of Japanese diplomat met Shaikha Hind bint Salman Al Khalifa, President of the Children and Mothers Welfare Society and handed over their proceeds as a donation, which was received at the Annual Embassies Bazaar 2015 through Japanese Booth earning. This event is organized annualy by the Society on the 11th of March 2015. At the Bazaar, the Japanese booth provided Japanese traditional goods such as accessories and tableware and acquired a favorable reputation from participants. 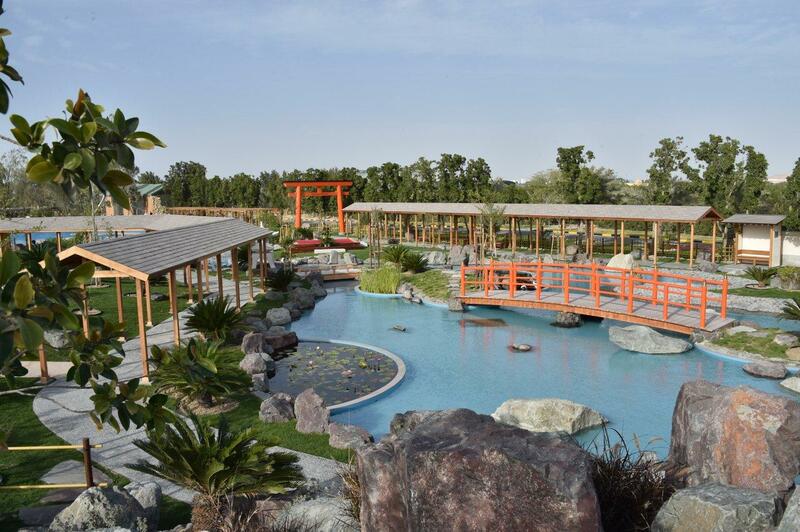 Inauguration of "Bahrain Japan Friendship Garden"
On the 18th of February 2015, the inauguration of the first authentic Japanese garden with a path around a central pond in Bahrain, "Bahrain Japan Friendship Garden," which has been invested by Gulf Petrochemical Industries Co. (GPIC) and has been designed and constructed by a Japanese company, Kosugi Zohen Co. Ltd., was held in Al Areen Wildlife Park. 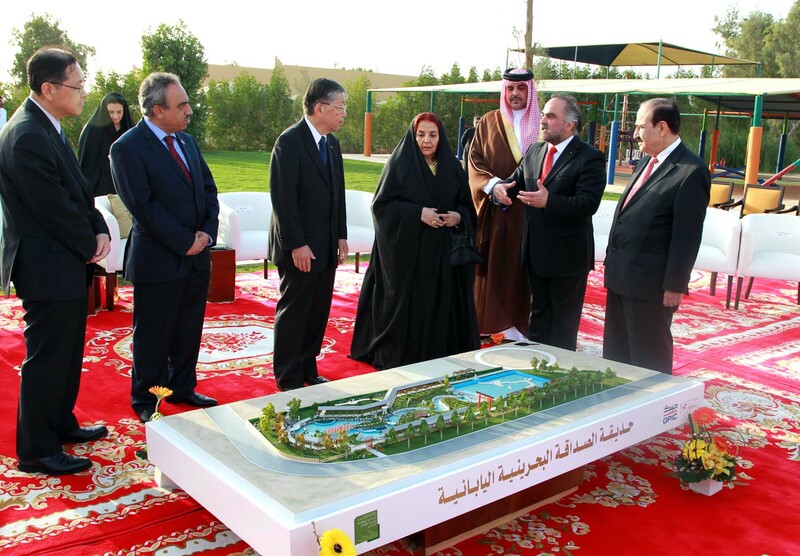 GPIC started to plan the garden after H.M. King Hamad bin Isa Al Khalifa's visit to Japan in April 2012. 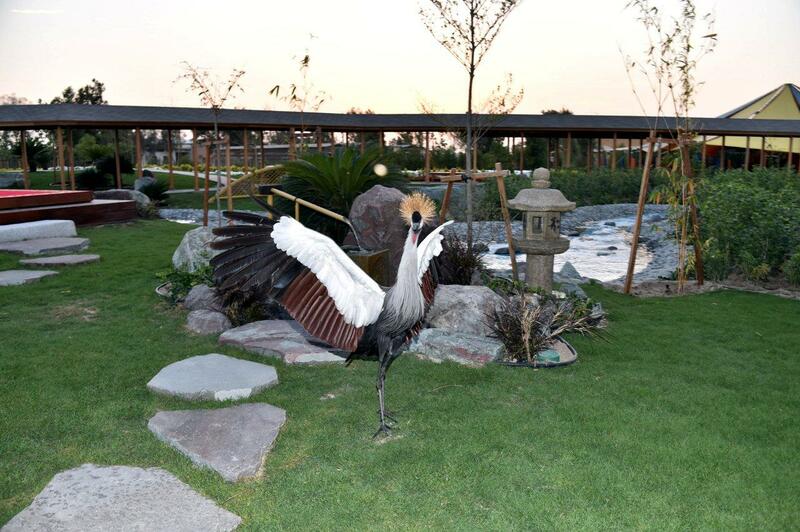 Also, Al Areen Wildlife Park was selected the location so that anyone can enjoy the garden. In the inauguration, H.E. 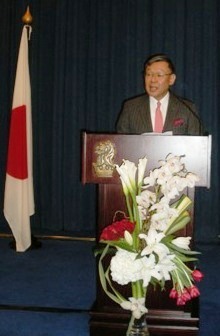 Mr. Kiyoshi Asako, Ambassador of Japan to the Kingdom of Bahrain, the royal family members including H.R.H. Princess Sabeeka and H.H. Abdulla bin Hamad Al Khalifa, Second Son of H.M. King Hamad, VIPs including H.E. Dr. Abdul-Hussain bin Ali Mirza, Minister of Energy, H.E. Mr. Esam bin Abdulla Khalaf, Minister of Works, Municipalities Affairs and Urban Planning and Mr. Khalid Almoayed, Chairman, Bahrain Chamber of Commerce and Industry (BCCI), Dr. Abdulrahman Jawahery, President, GPIC and Mr. Saki Kosugi, President, Kosugi Zohen Co. Ltd. Attended the ceremony. 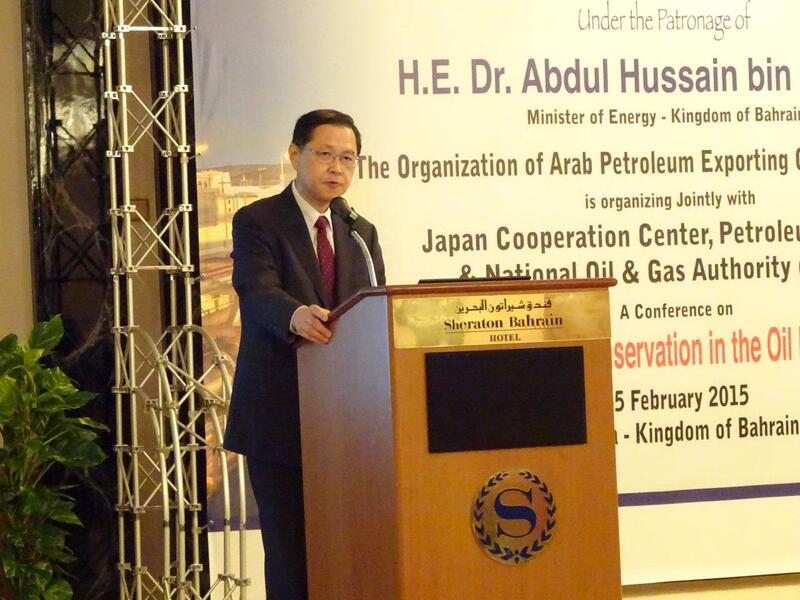 Conference "Options for Energy Conservation in the Oil Refining Industry"
On the 3rd of February 2015, Conference "Options for Energy Conservation in the Oil Refining Industry" was held at Sheraton Bahrain by Japan Cooperation Center, Petroleum (JCCP), the Organization of Arab Petroleum Exporting Countries (OAPEC) and National Oil & Gas Authority Bahrain (NOGA). H.E. 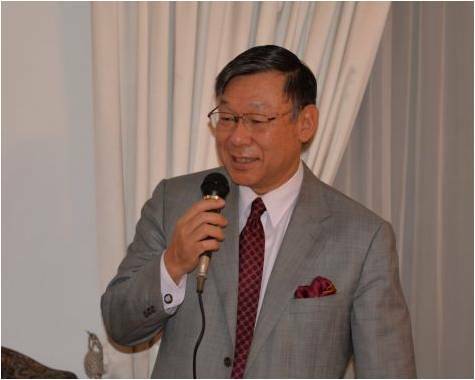 Mr. Kiyoshi Asako, Ambassador of Japan to the Kingdom of Bahrain, H.E. Dr. Abdul-Hussain bin Ali Mirza, Minister of Energy, H.E. 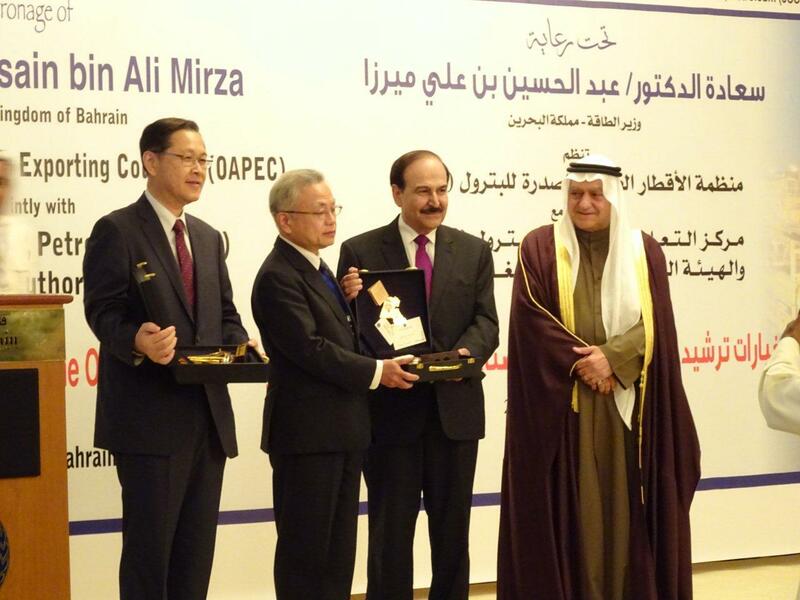 Mr. Abbas Al-Naqi, Secretary General, OAPEC and Mr. Eiji Hiraoka, Special Counselor, JCCP attended the opening ceremony. 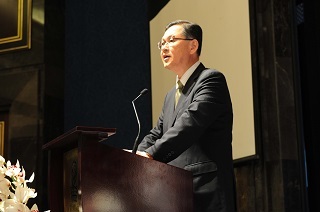 At the opening ceremony, the Ambassador mentioned that under the recent circumstance of the fierce competition with decreasing the Brent crude oil price, energy conservation in the oil refineries becomes one of the most effective ways for the optimization, and Japan, as the most advanced country that totally imports energy, and which has been tackling the development of energy conservation technologies in various fields. The Ambassador has also hoped that the conference would provide opportunities for all of participants here to take some tips for overcoming the recent difficulties and to create mutual relationship between OAPEC member states and Japan. 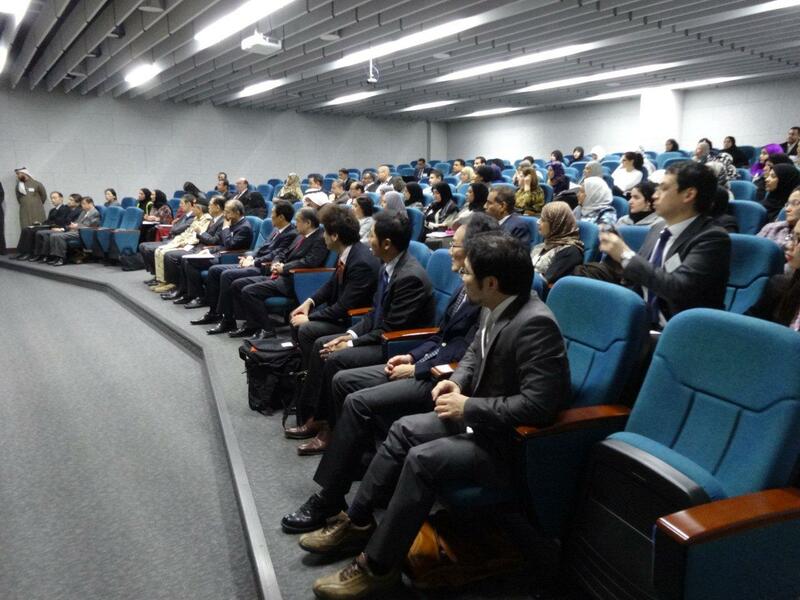 On the 12nd of January 2015, "Latest & Essential Knowledge of Translational Research and Clinical Trials" seminar was held at Arabian Gulf University by Consortium of Medical Cooperation and Development Japan and Ministry of Health in Bahrain and was supported by Medical Excellence Japan (MEJ). H.E. 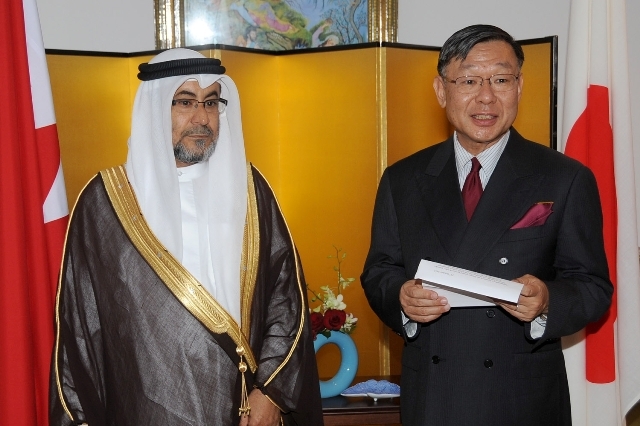 Mr. Kiyoshi Asako, Ambassador of Japan to the Kingdom of Bahrain and H.E. 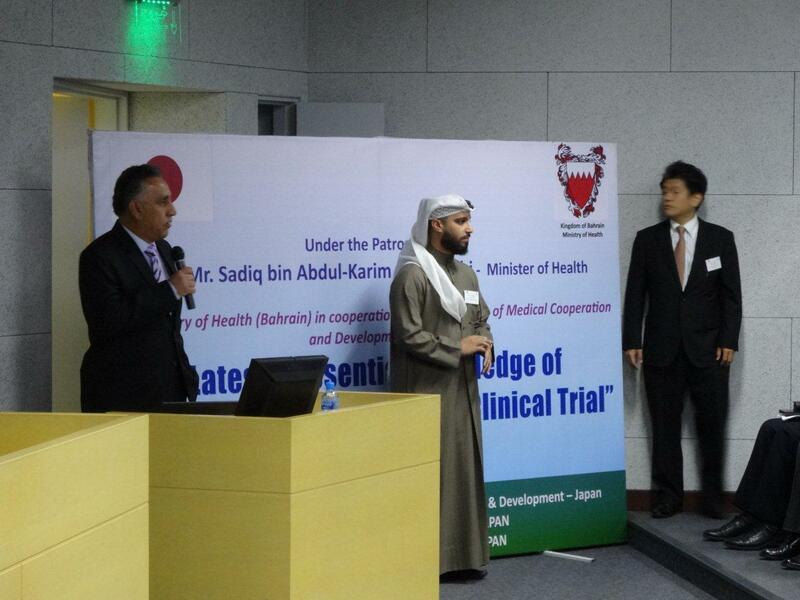 Mr. Sadiq bin Abdul Karim Al Shehabi, Minister of Health attended the opening ceremony. 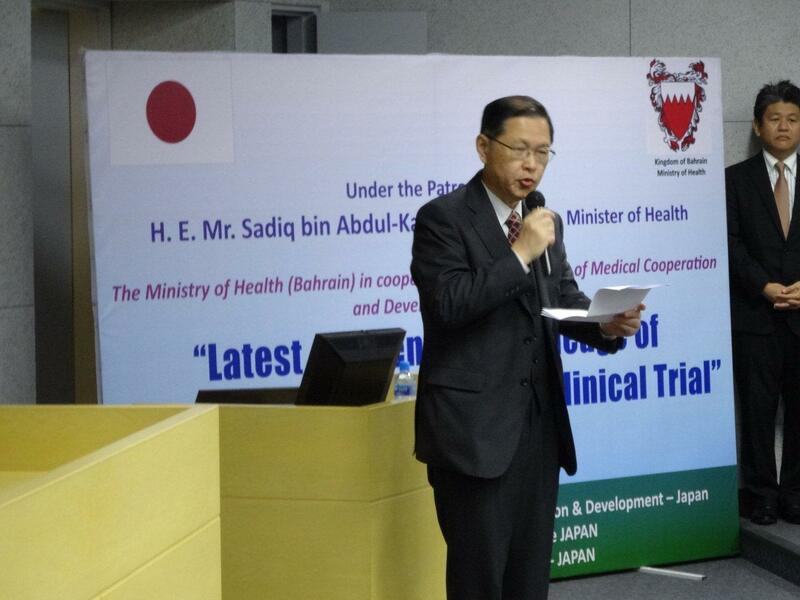 During the ceremony, the Ambassador hoped the seminar would provide opportunities to understand the cutting-edge information of translational researches and clinical trials and to create mutual relationship between the Bahraini professionals and the Japanese ones for developing infrastructure of translational research and clinical trial in Bahrain. 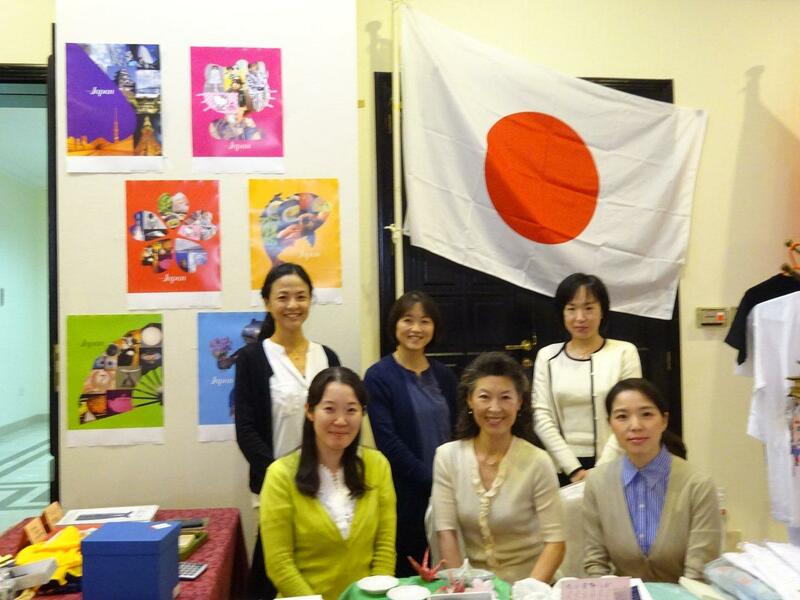 On the 12th of December 2014, the annual Aki Matsuri, or Autumn Festival, was held by the Japanese Society in Bahrain at the Japanese School in Saar. 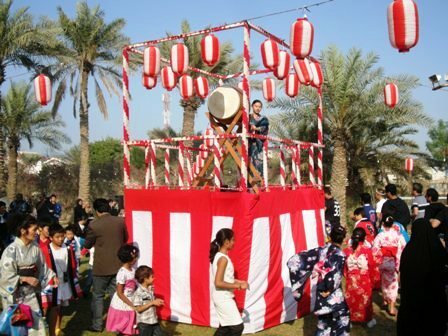 Japanese companies in Bahrain and the Japanese School ran Japanese food booths and functions such as traditional festival dance (Bon-dance) while the Embassy ran a curry booth and a ring-toss game booth. The guests seemed to enjoy the Japanese festival atmosphere and had a fun time. On the 10th of December 2014, H.E. Mr. Kiyoshi Asako, Ambassador of Japan to the Kingdom of Bahrain hosted a reception to celebrate His Majesty the Emperor's 81st Birthday. Approximately 350 distinguish guests including H.H. Shaikh Salman bin Khalifa Al Khalifa, Advisor of H.R.H. Prime Minister Prince Khalifa bin Salman Al Khalifa and other Bahraini government officials, ambassadors to the Kingdom of Bahrain, dignitaries of various sectors of Bahrain and representatives of Japanese companies gathered to celebrate the upcoming birthday of His Majesty the Emperor on December 23rd. In the venue, invited guests took pleasure in looking at Japanese gardens. 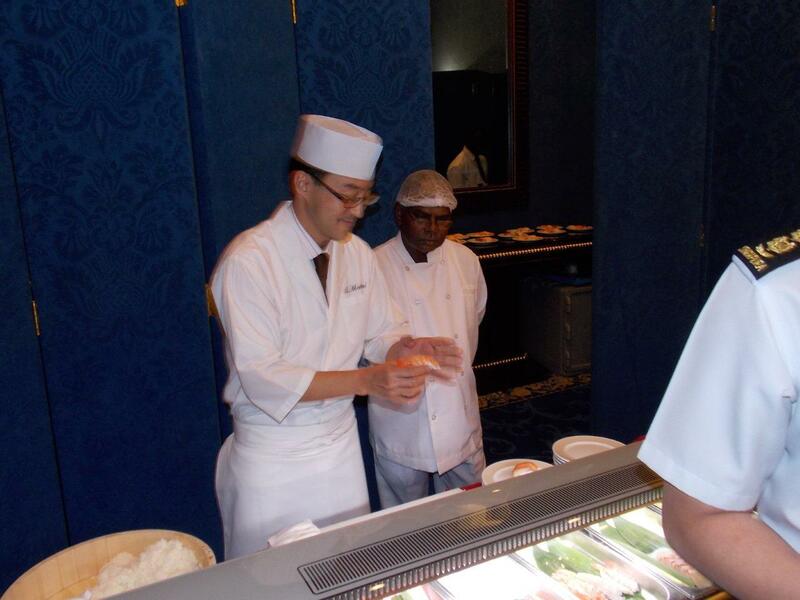 A Japanese chef, a resident in Bahrain, showed how to cook sushi. The venue was so alive with invitees. Japanese sake was served and was given a favourable reception by guests including non-Japanese. On the 3rd of September 2014, H.E. 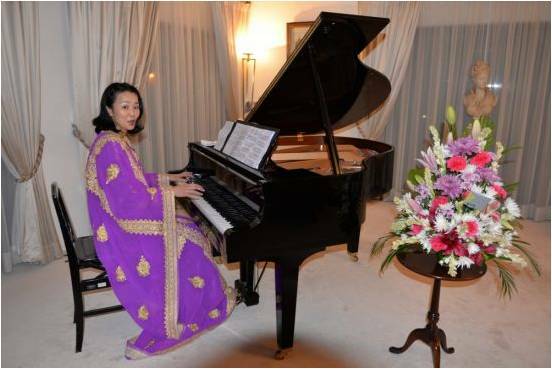 Mr. Shigeki Sumi, Ambassador of Japan and Mrs. Tomoko Sumi, the wife of him hold a reception at his residence, discussed with high-rank officials in Bahrain, diplomatic corps in Bahrain and executives in Bahraini companies, and showed a piano performance by Ms. Mina Iwahashi, a Japanese resident in Bahrain and a teacher in the Japanese school in Bahrain. Total approximately 70 guests including H.E. Mr. Hassan Fakhro, Minister of Industry and Commerce, H.E. Mr. Kareem Al-Shakar, Undersecretary for International Affairs, Ministry of Foreign Affairs, Mr. Mubarak Jassim Kanoo, Chairman of Bahrain-Japan Business Friendship Society, Vice-Admiral John W. Miller, Commander, Fifth Fleet, the US Navy and Ambassadors to the Kingdom of Bahrain attended the reception, and Ms. Iwahashi’s performance had a favorable reception. 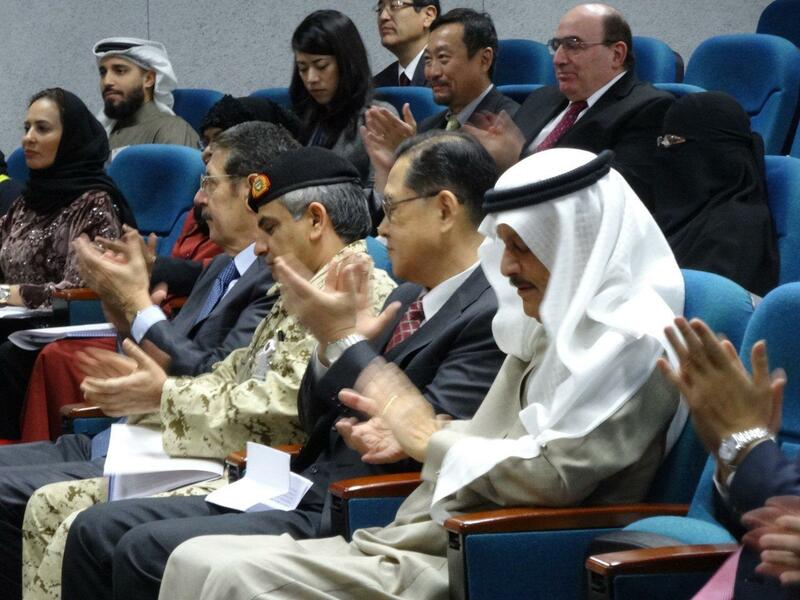 From 20th to 27th of April 2014, Bahrain-East Asian Parliamentary Friendship Committee at the Shura Council (Chairman: H.E. Dr. Shaikh Khalid bin Khalifa Al Khalifa, Chairman of the Committee on Foreign Affairs, Defense and National Security) visited Japan. The Committee members paid courtesy calls to and met senior Japanese officials, including H.E. Mr. Takao Makino, Parliamentary Vice-Minister for Foreign Affairs, and Japan-Bahrain Parliamentary Friendship League (Chairman: H.E. Mr. Yasuhisa Shiozaki, Member of the House of Representatives) on the 24th of April. 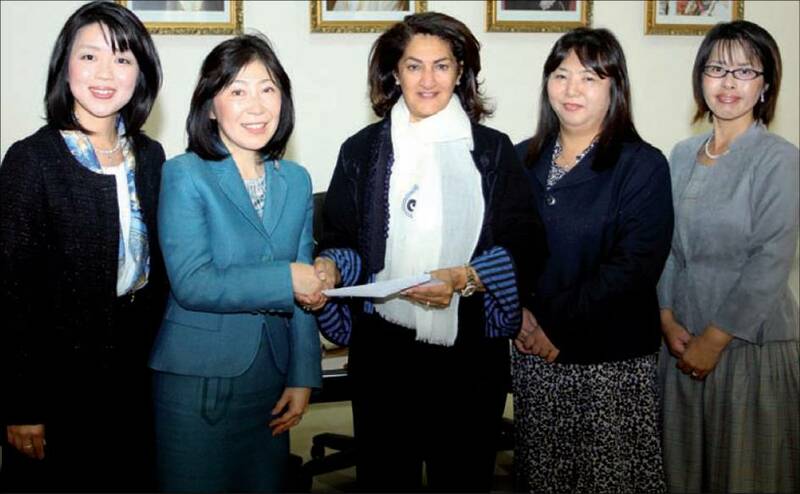 On the 2nd of April 2014, Ms. Tomoko Sumi, the wife of Japanese Ambassador, and the wives of Japanese diplomats met Shaikha Hind bint Salman Al Khalifa, President of the Children and Mothers Welfare Society and handed over their proceeds as a donation, which was received at the Japanese booth at the Annual Embassies Bazaar 2014 organized by the Society on the 16th of March 2014. At the Bazaar, the Japanese booth provided Japanese traditional goods such as accessories and tableware and acquired a favorable reputation from participants. From 10th to 14th of February 2014, H.E. 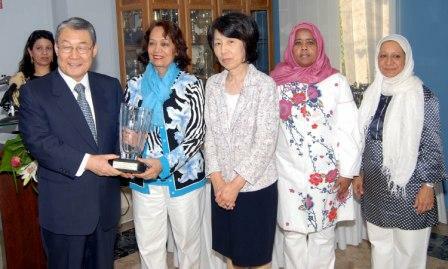 Dr. Salah Ali Mohamed Abdulrahman, Minister of State for Human Rights visited Japan. He met H.E. 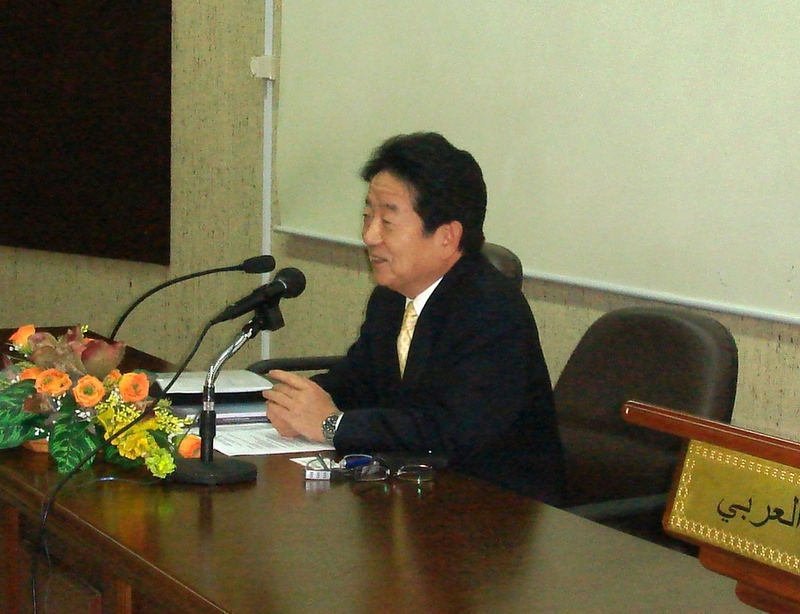 Mr. Nobuo Kishi, Parliamentary Senior Vice-Minister for Foreign Affairs on the 14th of February. On the 10th of December 2013, H.E. Mr. Shigeki Sumi, Ambassador of Japan to the Kingdom of Bahrain hosted a reception to celebrate His Majesty the Emperor's 80th Birthday. Approximately 350 distinguish guests including H.H. Shaikh Salman bin Khalifa Al Khalifa, Advisor of H.R.H. Prime Minister Prince Khalifa bin Salman Al Khalifa and other royal family, H.E. 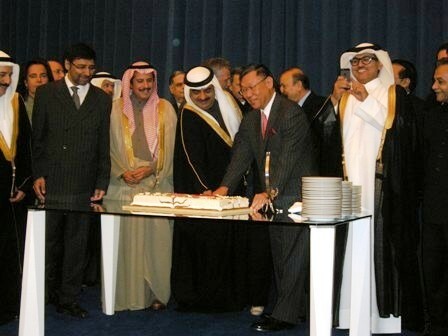 Dr. Hassan bin Abdulla Fakhro, Minister of Industry and Commerce and other ministers, ambassadors to the Kingdom of Bahrain and his or her spouses, dignitaries of various sectors of Bahrain and representatives of Japanese companies gathered to celebrate the upcoming birthday of His Majesty the Emperor on December 23rd. 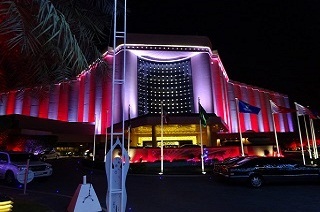 The Ritz-Carlton Hotel as the venue was illuminated red and white which is the symbol of the Japanese Flag. A thousand folded paper (origami) cranes were decorated in the entrance hall. 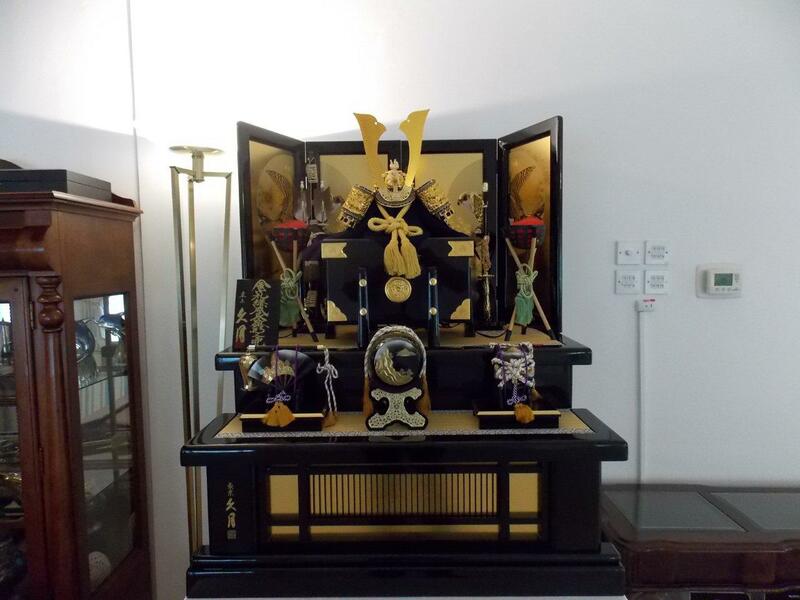 On the 29th of November 2013, the annual Aki Matsuri, or Autumn Festival, was held by the Japanese Society in Bahrain at the Japanese School in Saar. 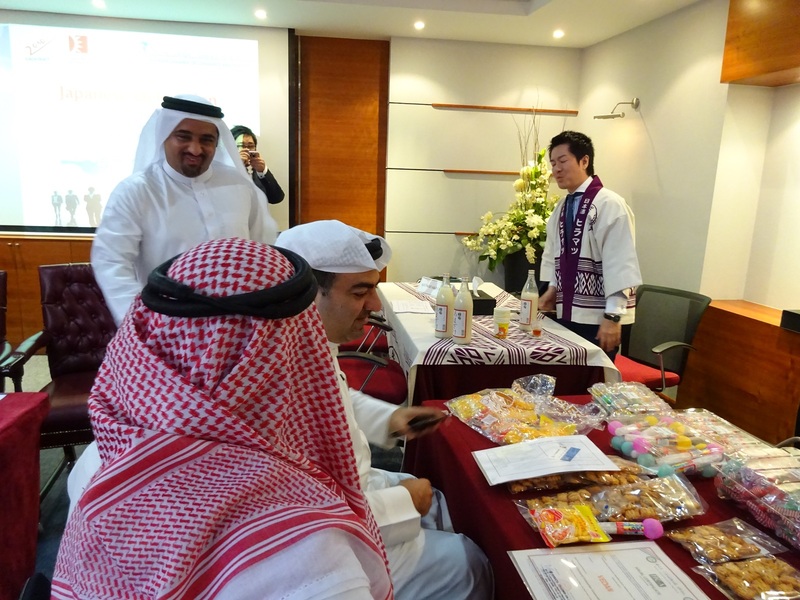 Japanese companies in Bahrain and the Japanese School ran Japanese food booths and functions such as traditional festival dance (Bon-dance) while the Embassy ran a curry booth, a ring-toss game booth and a cut-out cookie booth. The guests seemed to enjoy the Japanese festival atmosphere and had a fun time. On the 26th of November 2013, H.R.H. Princess Sabeeka bint Ibrahim Al Khalifa, Wife of the King of Bahrain visited the Japanese School in Bahrain. H.E. 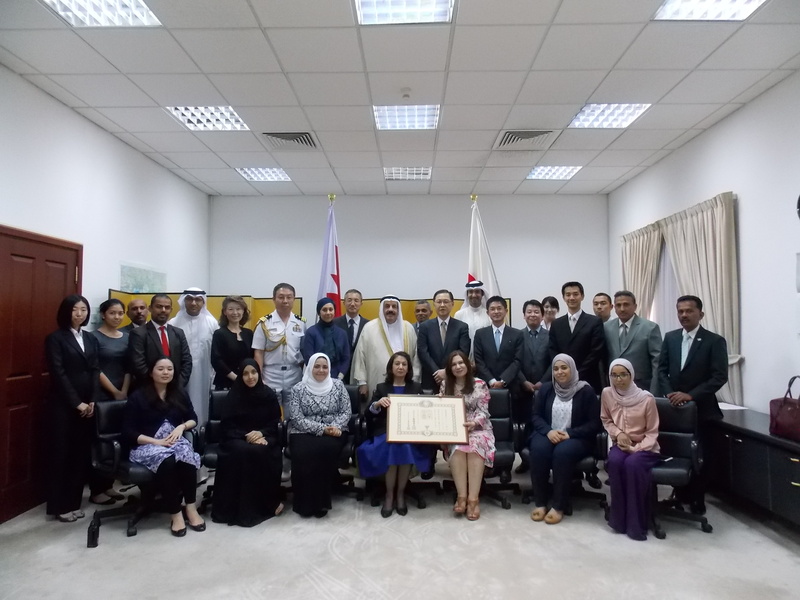 Mr. Shigeki Sumi, Ambassador of Japan to the Kingdom of Bahrain, Ms. Tomoko Sumi, the wife of the Japanese Ambassador, the headmaster of the Japanese School and the PTA chairperson received H.R.H. Princess and H.R.H. Princess was showed into the venue. In the venue, the students of the Japanese School sang songs and gave presentations in English and Arabic. After that, H.R.H. Princess was guided in the school grounds by the headmaster and moved to the schoolyard. In the schoolyard, the students performed "Nantyu Soran", which is a Japanese traditional dance but the music is re-arranged as a modern-style. 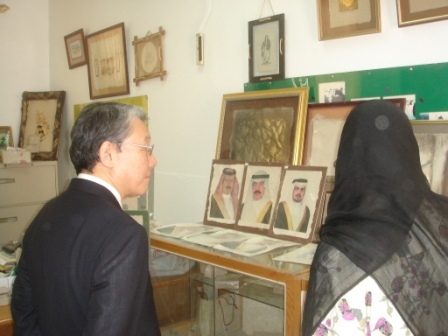 In November 2013, Ms. Makiko SEN, the Eldest Daughter of SEN Soshitsu �]�Y, who is the Grand Master of Urasenke and Mr. Koichiro IZUMI, the Nephew of SEN Soshitsu �]�Y visited Bahrain. 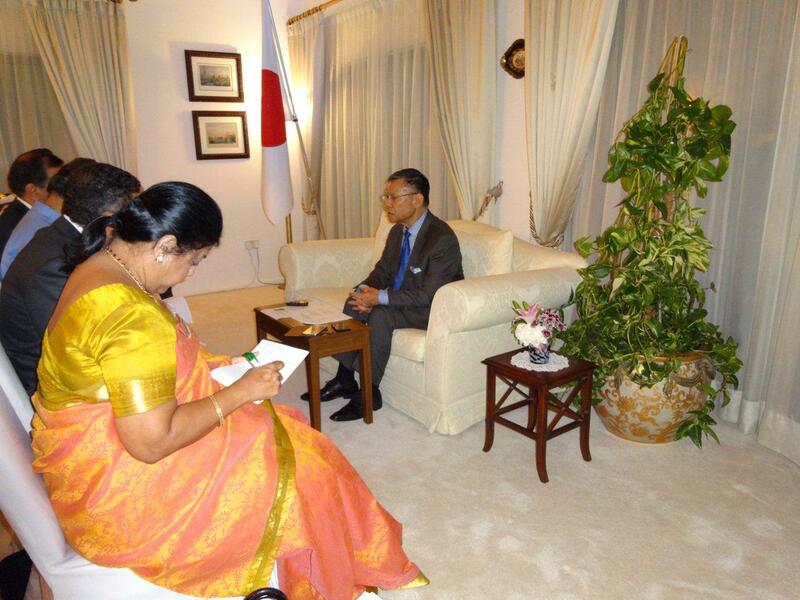 Ms. SEN and Mr. IZUMI made a courtesy call on H.E. 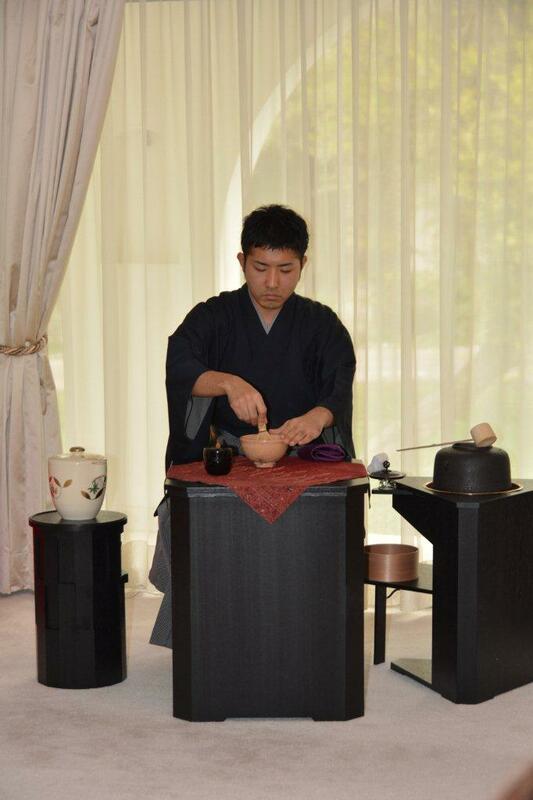 Mr. Shigeki Sumi, Ambassador of Japan to the Kingdom of Bahrain, hold tea ceremonies in the Rawdha Palace, the Japanese Ambassador's residence and the Japanese School. In the Rawdha Palace's event, they served tea for H.R.H. Princess Sabeeka bint Ibrahim Al Khalifa, Wife of the King of Bahrain, H.R.H. Prince Salman bin Hamad Al Khalifa, Crown Prince, Deputy Supreme Commander and First Deputy Prime Minister and the other royal family. 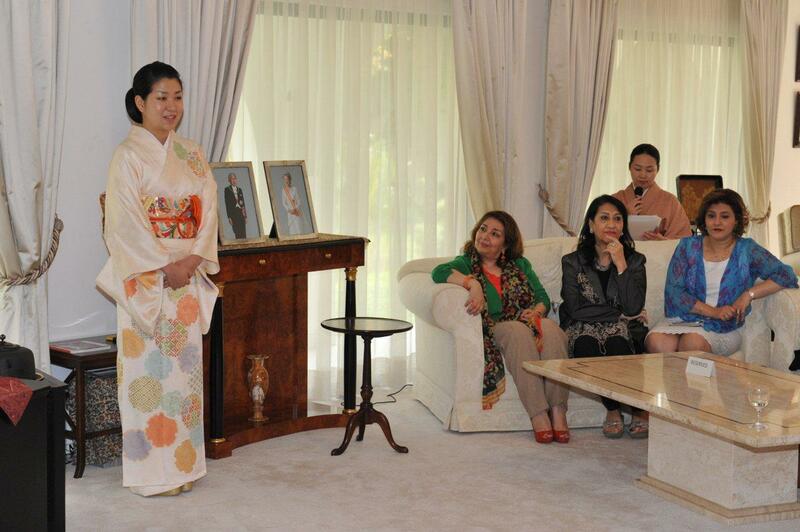 In the Japanese Ambassador's residence's event organised by Ms. Tomoko Sumi, the wife of the Japanese Ambassador, Ms. SEN and Mr. IZUMI served tea for the royal family, wives of ambassadors to Bahrain and wives of leading people in Bahrain. In the Japanese School's event, Ms. SEN and Mr. IZUMI explained the way of tea to the students and their parents, served tea for all of attendees, then the students and their parents experienced making tea. From 25th to 28th of September 2013, H.H. 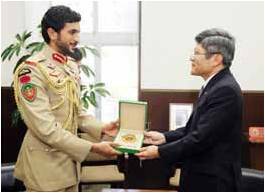 Shaikh Nasser Bin Hamad Al Khalifa, the fourth son of H.M. King Hamad bin Isa Al Khalifa, visited Japan. He attended the opening ceremony of the 68th National Athletic Meet in Chofu City on 28th and greeted H.M. Emperor Akihito, Emperor of Japan. Also, He met H.I.H. 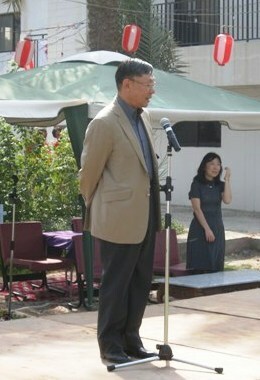 Prince Akishino, H.E. Ms. Masako Mori, Minister of State for Special Missions, H.E. Mr. Shigeru Iwasaki, Chief of Joint Staff of Japan's Self Defense Forces General, H.E. Eiichi Kuga, Chief of Imperial Guard Headquarters, H.E. Tsunekazu Takeda, Japanese Olympic Committee (JOC) President and H.E. Naoki Inose, Tokyo Governor. On the 25th of August 2013, H.E. 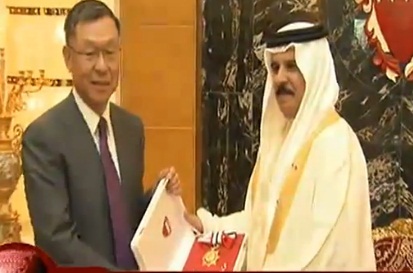 Mr. Shigeki Sumi, Ambassador of Japan to the Kingdom of Bahrain was decorated the Bahraini First Order of Merit by H.M. King Hamad bin Isa Al Khalifa. 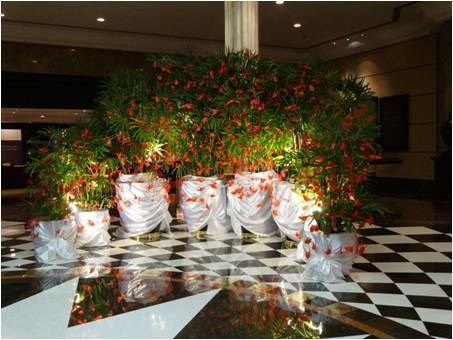 It is the first time that an Ambassador has decorated during his term in Bahrain. On the 21st of August 2013, H.E. 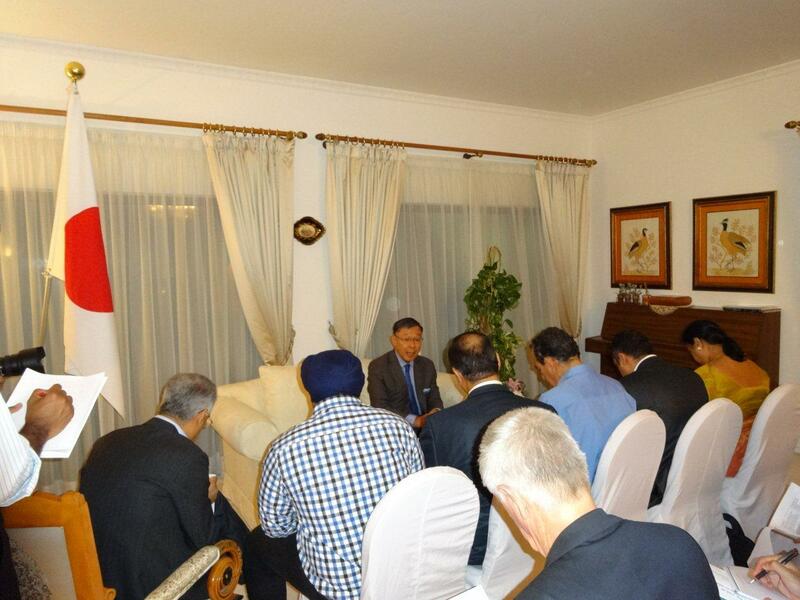 Mr. Shigeki Sumi, Ambassador of Japan to the Kingdom of Bahrain held a press conference at the Ambassador’s Residence for Bahraini reporters to explain the details of Prime Minister H.E. Mr. Shinzo Abe’s Visit to Bahrain which is planned to take place from the 24th to the 25th of August. On the 19th of August 2013, H.E. 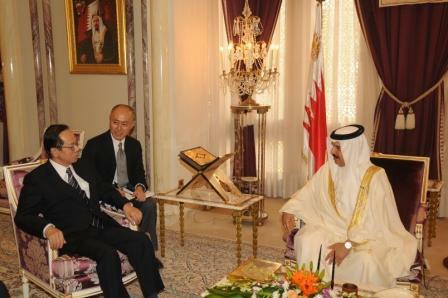 Mr. Shigeki Sumi, Ambassador of Japan of the Kingdom of Bahrain explained Prime Minister H.E. Mr. Shinzo Abe’s Visit to Bahrain to H.R.H. Prince Khalifa bin Salman Al Khalifa, the Prime Minister in advance. And on the 20th of August 2013, the Ambassador also explained to H.M. King Hamad bin Isa Al Khalifa. On the 13th of March 2013, H.E. 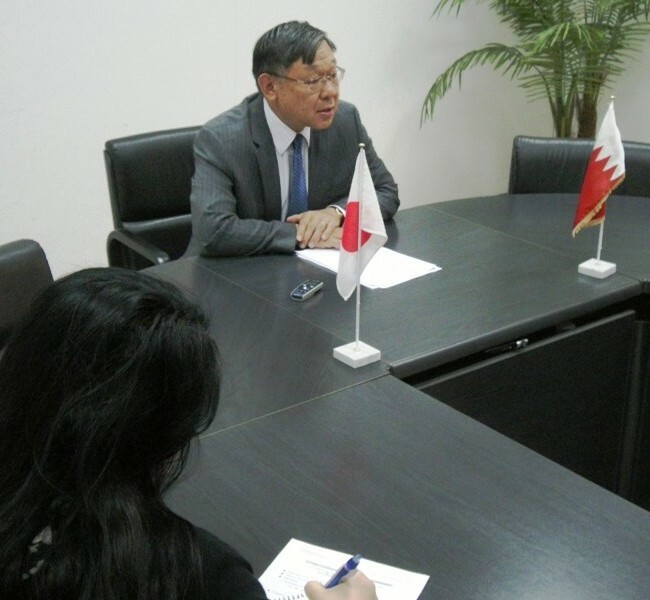 Mr. Shigeki Sumi, Ambassador of Japan to the Kingdom of Bahrain held a press conference at the Embassy for Bahraini reporters to explain the details of H.R.H. Prince Salman bin Hamad Al-Khalifa, Crown Prince of Bahrain’s visit to Japan which is planned to take place from the 19th to the 22th of this month. 1) To strengthen the relationship between the Royal Family and the Imperial Family. 2) To exchange views on political agenda with Japanese political leaders. 3) To deepen the cultural ties between the two countries. 4) To deepen the business relationship between the two countries, and attend the reception hosted by Economic Development Board, and witness signing of business MOUs. On the 6th of February 2013, Ms. Tomoko Sumi, the wife of Japanese Ambassador, and the wives of Japanese diplomats met Shaikha Hind bint Salman Al Khalifa, President of the Children and Mothers Welfare Society and handed over their proceeds as a donation, which was received at the Japanese booth at the Annual Embassies Bazaar 2013 organized by the Society on the 30th of January 2013. At the Bazaar, the Japanese booth provided Japanese traditional goods such as accessories and tableware and acquired a favorable reputation from participants. On the 4th of December 2012, H.E. Mr. Shigeki Sumi, Ambassador of Japan to the Kingdom of Bahrain hosted a reception to celebrate His Majesty the Emperor's 79th Birthday. Approximately 450 distinguish guests including ministers, dignitaries of various sectors of Bahrain and representatives of Japanese companies gathered to celebrate the upcoming birthday of His Majesty the Emperor on December 23rd. 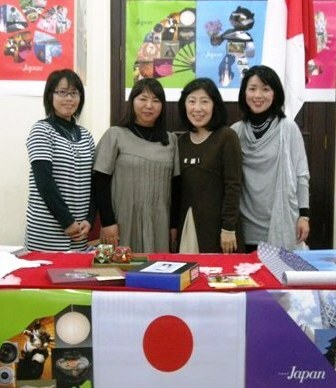 On the 30th of November 2012, the annual Aki Matsuri, or Autumn Festival, was held by the Japanese Society in Bahrain at the Japanese School in Saar. 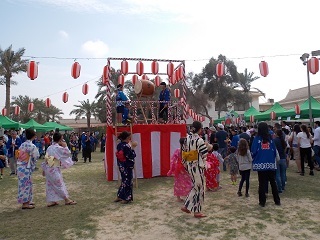 Japanese companies in Bahrain and the Japanese School ran Japanese food booths and functions such as traditional festival dance (Bon-dance) while the Embassy ran a curry booth and ring-toss game booth. The guests seemed to enjoy the Japanese festival atmosphere and had a fun time. On the 21st of October 2012, H.E. Mr. Shigeki Sumi, Ambassador of Japan to the Kingdom of Bahrain hosted a reception to celebrate the 40th anniversary of the establishment of Diplomatic relations between Bahrain and Japan along with the successful visit of H.M. King Hamad to Japan. H.E. Mr. Ghanim bin Fadhl Al Buainain, the Minister of State for Foreign Affairs attended the reception to congratulate the Japanese leadership and people on this occasion with the Kingdom of Bahrain are proud of it. The Japanese Ambassador also lauded the ongoing cooperation and ties existing between the two countries in all fields. On the 18th of March 2012, H.E. 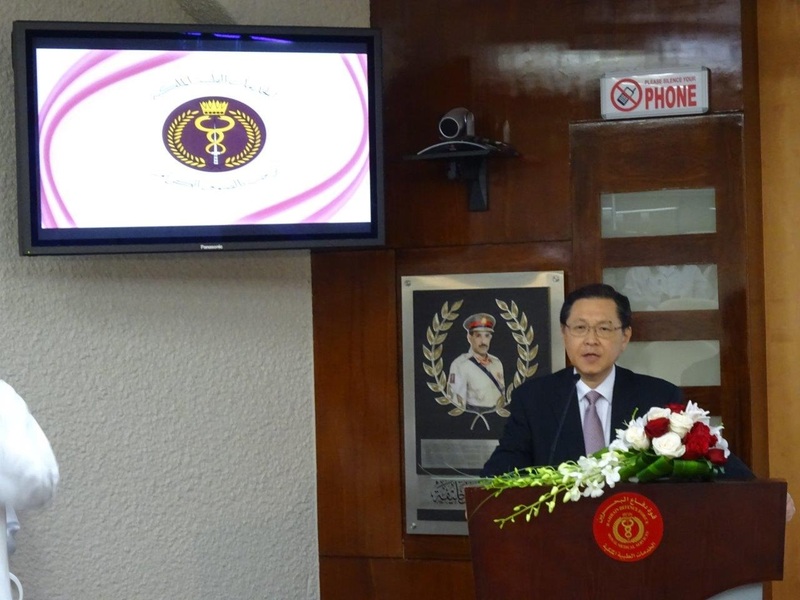 Mr. Shigeki Sumi, Ambassador of Japan to the Kingdom of Bahrain held a press conference at the Embassy for Bahraini reporters to explain the details of H.M. King Hamad bin Isa Al-Khalifa, King of Bahrain’s visit to Japan which is planned to take place from the 11th to the 13th of next month. 1) To develop multiple bilateral relations including politics and security as part of the 40th anniversary of the establishment of diplomatic relations between Bahrain and Japan. 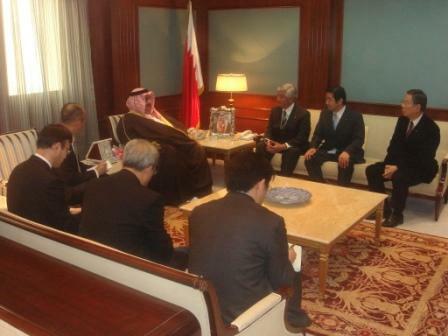 2) To promote business between Bahrain and Japan. 3) To express support for the political and social reform initiative by H.M. King Hamad. 4) To appeal the Japanese contribution for regional security in the Middle East. 5) To enhance relations between the royal family of Bahrain and the imperial family of Japan. On the 11th of March 2012, to mark the one year memorial of the tragic earthquake that struck east Japan H.E. 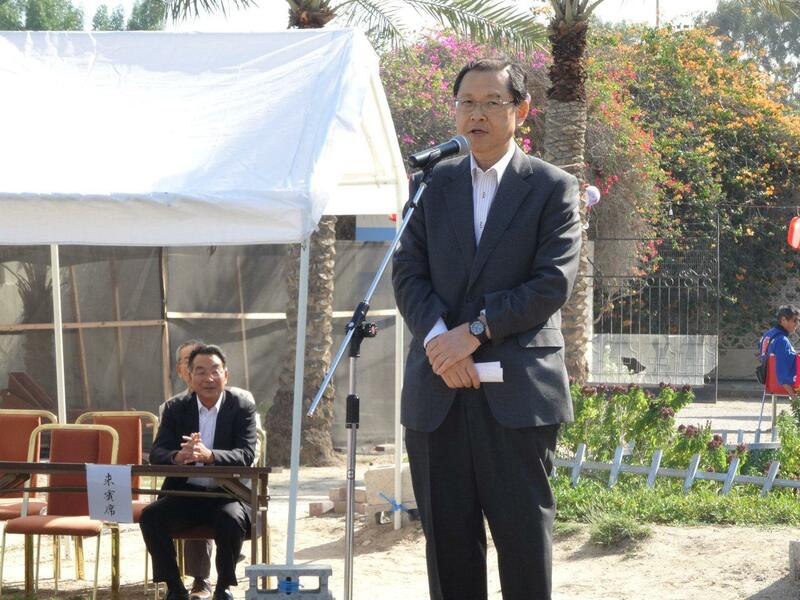 Mr. Shigeki Sumi, Ambassador of Japan to the Kingdom of Bahrain held an exhibition showing Japan's steady revival, "Reception in Commemoration of the Great East Japan Earthquake". We did this in order to commemorate those victims who lost their lives and to show our sincere gratitude for the support we received daily from all around the world. 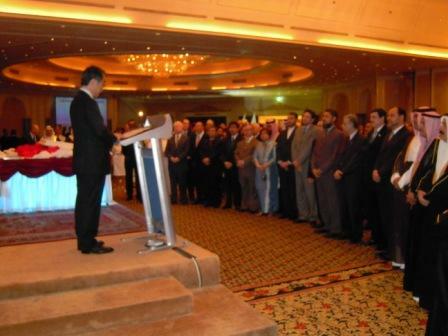 Approximately 300 people from all quarters attended, including, Shaikh Khalid bin Ahmed bin Mohammed Al-Khalifa, the Minister of Foreign Affairs along with other royal family members and government officials, Japanese company representatives, and teachers and students from the Japanese School in Bahrain. The exhibition continued the next day bringing in 100 more visitors including teachers and students from the area's French School. On the 1st of February 2012, Ms. Tomoko Sumi, the wife of the Japanese Ambassador, and the wives of Japanese diplomats met Shaikha Hind bint Salman Al Khalifa, President of the Children and Mothers Welfare Society and handed over their proceeds as a donation, which was received at the Japanese booth at the Annual Embassies Bazaar 2012 organized by the Society on the 25th of January 2012. At the Bazaar, the Japanese booth provided Japanese traditional goods such as yukatas and tableware and acquired a favorable reputation from participants. On the 7th of December 2011, H.E. Mr. Shigeki Sumi, Ambassador of Japan to the Kingdom of Bahrain hosted a reception to celebrate His Majesty the Emperor's 78th Birthday. Approximately 300 distinguished guests including ministers, dignitaries of various sectors of Bahrain and representatives of Japanese companies gathered to celebrate the upcoming birthday of His Majesty the Emperor on December 23rd. On the 12th of September 2011, H.E. 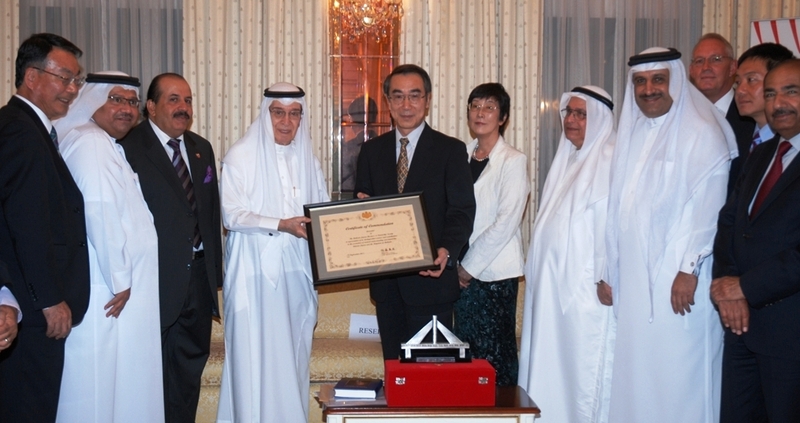 Mr. Hideo Sato, Ambassador of Japan to the Kingdom of Bahrain awarded the Bahrain-Japan Business & Friendship Society the Certificate of Commendation in appreciation of its distinguished services and contributions to the promotion of mutual understanding and friendship between the Kingdom of Bahrain and Japan. At the dinner reception, to bid farewell to H.E. hosted by the society on the same day, H.E. was praised for his contributions and support in boosting bilateral relations. H.E. thanked ministry officials and the society for its support to the Japanese Embassy’s activities and requirements. On the 23rd of June 2011, Public Affairs Officer of the Embassy visited the Iqura Library for children, newly opened at Malkiya area by the Shaikh Ebrahim Center, and donated 5 Japanese picture books written in Arabic, DVDs and stationery products. Many children gathered together at the library to read books and play computer games etc. 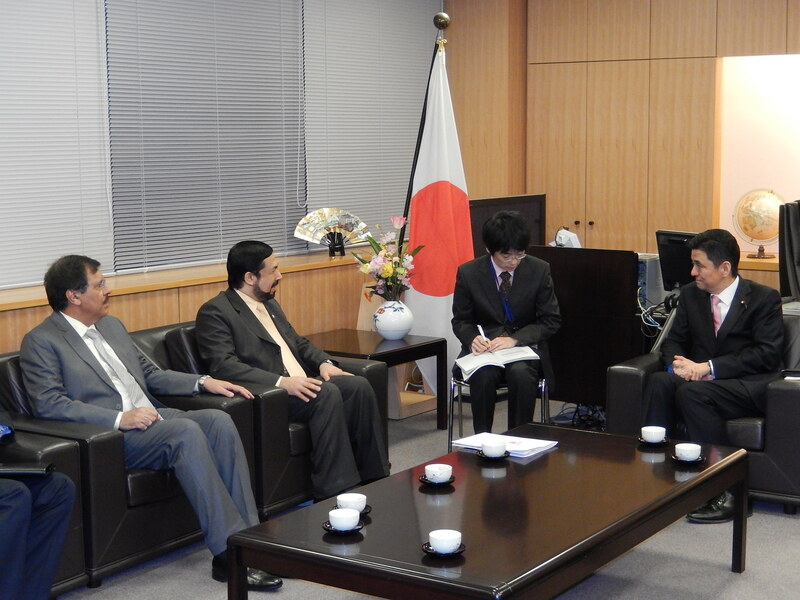 On the 3rd of April 2011, board members of the Bahrain-Japan Friendship Society, headed by Mr. Mubarak Kanoo, President of the Society, visited the Embassy to convey their condolences and sympathy to the victims of the Great East Japan Earthquake that shook Japan on the 11th of March. The delegation was joined by H.E. Dr. Khalil Hassan, Bahrain’s Ambassador to Japan, and Dr. Dhafer Al Umran, Bilateral Relations Director of the Ministry of Foreign Affairs. Ambassador Satoexpressed thanks for the condolences given by the Society and explained the details of the disaster caused by the greatest earthquake on record in Japan. He expressed his hope that Japan would soon overcome the challenges with the help of its international friends, as it did before. Referring to the concerns of radioactive contamination, he reassured that given the strict monitoring conducted in Japan, the safety of products being marketed in Japan and exported from Japan is ensured and stressed that people should not overreact to media reports. 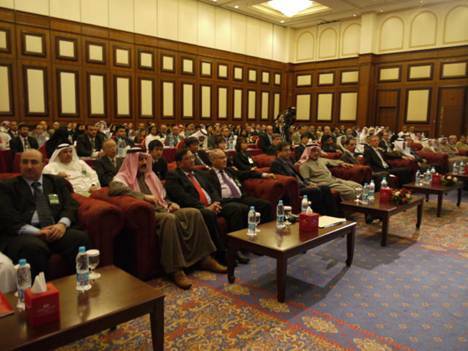 The Bahrain-Japan Business Forum 2011 took place under the patronage of the Minister of Commerce and Industry, H.E. Dr. Hassan Fakhro, at the Golden Tulip Hotel on the 2nd of February 2011. The forum was organized by the Ministry of Economy, Trade and Industry (METI) of Japan and the Japan External Trade Organization (JETRO) in cooperation with Economic Development Board (EDB), National Oil and Gas Authority (NOGA), Mumtalakat and Bahrain-Japan Friendship Society. 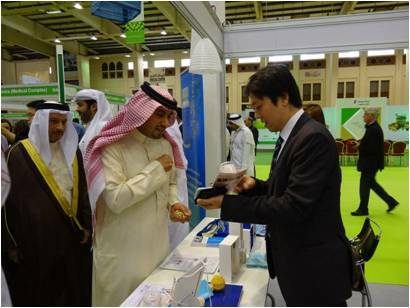 In this forum, 22 representatives from 18 Japanese companies, which was made up of venture companies and others presented their innovative and unique products in fields such as green technology, renewable energy, medical equipment and software, and discussed with Bahraini companies about the possibilities of coodinating their business with one another. H.E. Dr. Hassan Fakhro, the Minister of Industry and Commerce, and H.E. 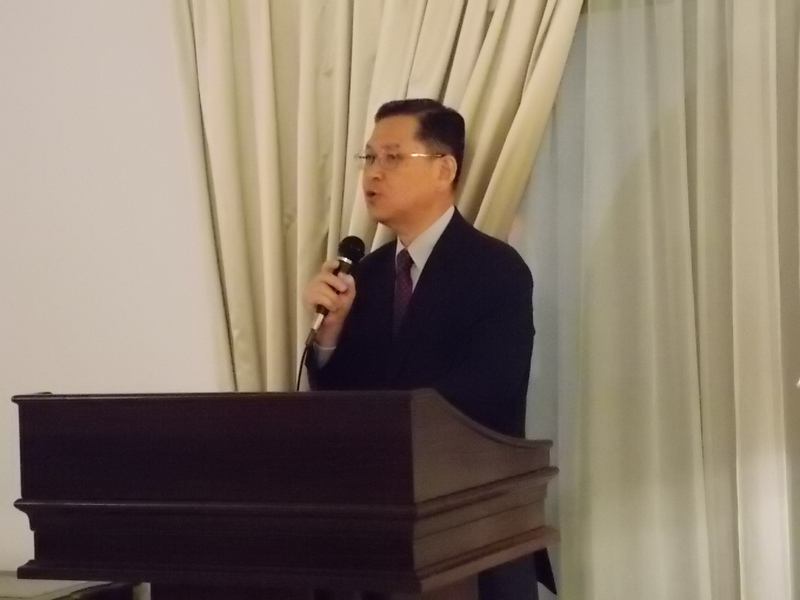 Mr. Hideo Sato, the Japanese Ambassador, addressed opening remarks, and representatives from MTEI and Tamkeen explained the economic growth strategies of each country. 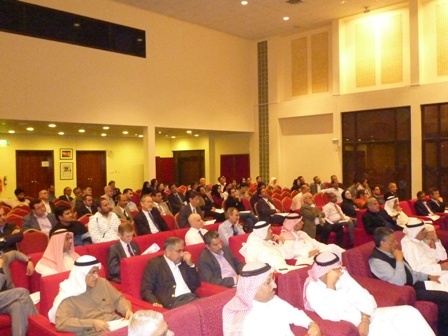 More than 130 people including government officials and major businessmen in Bahrain attended the forum. On the 1st of December 2010, Ambassador Hideo Sato hosted a reception to celebrate His Majestry the Emperor's 77th Birthday. 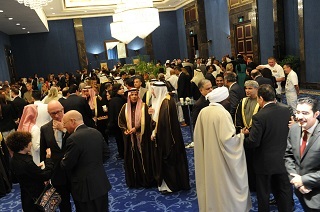 His Highness Shaikh Khalifa bin Ali Al Khalifa attended the reception. More than 400 distinguish guests including ministers, dignitaries of various sectors of Bahrain and representatives of Japanese companies gathered to celebrate the upcoming birthday of His Majesty the Emperor on December 23rd. 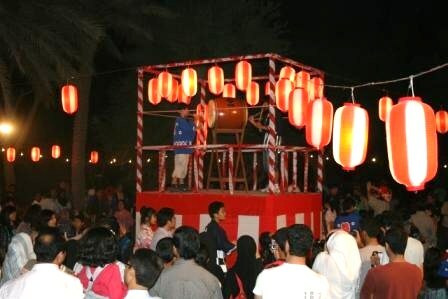 On the 26th of November 2010, the annual Aki Matsuri, or Autumn Festival, was held by the Japanese Society in Bahrain at the Japanese School in Saar. 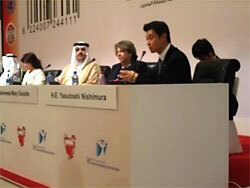 The event drew more than 1,000 Japanese, Bahraini and international participants. Japanese companies and the Japanese School ran Japanese food booths and functions such as traditional rice cake making, traditional festival dance (Bon-dance), and a watermelon cracking game while the Embassy ran a curry booth and ringtoss game booth. The guests seemed to enjoy the Japanese festival atmosphere and had a fun time. On the 8th of July 2010, Mrs. Hideko SATO, the wife of the Japanese Ambassador, and the wives of Japanese diplomats met Shaikha Hind bint Salman Al Khalifa, president of the Mother and Children Welfare Society and handed over their proceeds as a donation, which was received at the Japanese booth at the Annual Embassies Bazaar 2010 organized by the Society on the 12th of May 2010. 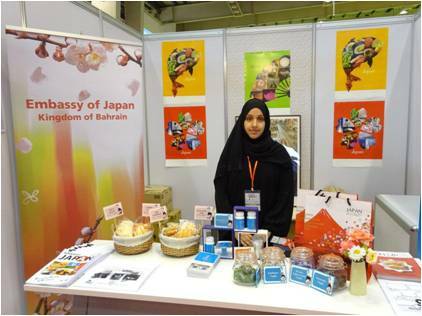 At the Bazaar, in cooperation with the Japanese community in Bahrain, the Japanese booth provided Japanese traditional goods such as vases and tableware and handmade goods, and acquired a favorable reputation from participants. From 13th to 15th May, the Embassy of Japan participated in and set up its own Japan booth at the occasion of the 6th Bahrain International Travel Expo to promote tourism to Japan. This initiative was taken in the framework of “Visit Japan Campaign”. The booth introduced Japan’s tourist spots and beautiful sceneries through DVDs and panels, and collection of brochures were available to visitors. Visitors were complimented with cups of Japanese tea and Origami (Japanese traditional art of paper holding) cranes. 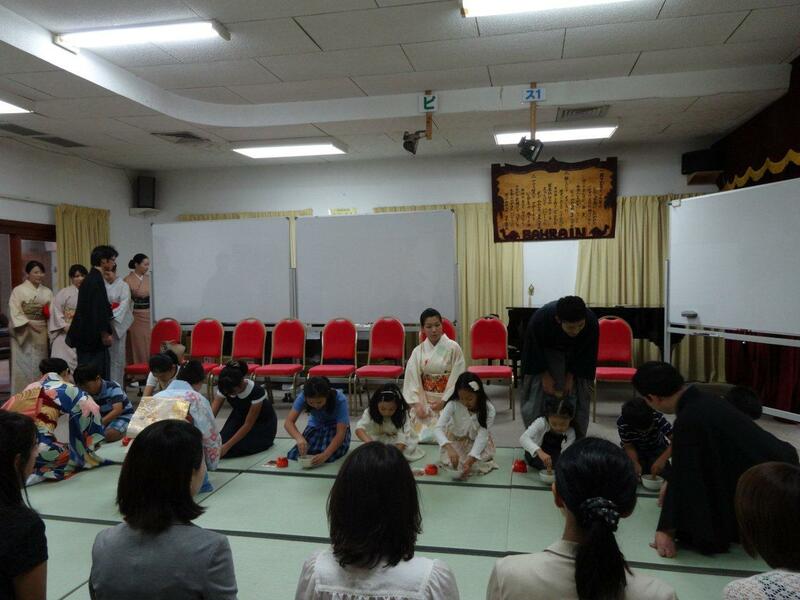 On 11th May, 2010, a Japanese cultural event entitled “Zen Culture and Japanese Cooking” was hosted by Mrs. Hideko Sato, wife of the Ambassador of Japan, as part of the Jusoor Program of the Ministry of Foreign Affairs of Bahrain. This program is designed for ladies as a bridge between Bahrain and the rest of the world to promote mutual understanding by learning alternately the history, culture, politics and economy of the host country through various events. “Jusoor” means bridges in Arabic. H.E. Shaikha Wesal bint Mohammed Al Khalifa, wife of the Minister of Foreign Affairs and President of the Jusoor Program, wives of Bahraini dignitaries and Ambassadors, and other invited guests attended the event. Mrs. Ambassador made a presentation on Zen culture and the guests enjoyed various sceneries of Japan on DVD, demonstration of tofu cooking and Japanese foods. 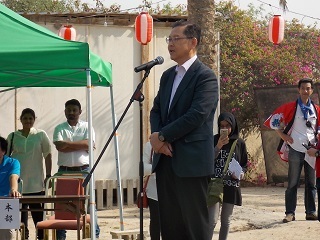 On the 29th March, Embassy of Japan in cooperation with Fukuda research room of Meiji University, University of Bahrain (UOB) and Friends of the Environment club-UOB held an environmental symposium for youth entitled: “Think Globally and Act Locally to save our future” at the UOB campus. The main lecture was provided by Dr. Majeed Jassim, Assistant Professor, Chemical Engineering Department, College of Engineering of UOB, as he briefed Japan’s experience of addressing the environment issues. Also, two Bahraini students, Shaikha Elaiwy and Fahad Muslem, and one Japanese student, Mr. Ysushi Ohno, Meiji University of Japan, who was connected via internet, gave presentations on their own experience in protecting the environment. On 23rd March, a diplomat of Japanese Embassy visited A’ali Boys Intermediate School as he gave a presentation on different aspects of Japan, such as Japan’s geography, industry, food and tradition. Around 24 students enjoyed attending this class alongside with three teachers and learned about Japan. It is worth mentioning that the children interacted actively with the presentation and called for another similar activity in the future. On 16th March the Japan Foundation in cooperation with the Embassy of Japan organized a seminar entitled “Balancing Industrial Development and the Environment: Making the best use of local knowledge and indigenous Practices” under the patronage of H.H. Shaikh Abdullah bin Hamad Al-Khalifa, the President of the Public Commission for the Protection of Marine Resources, Environment and Wildlife. In this seminar, Prof. Ryo Fujikura, Faculty of Humanity and Environment, Hosei University, and Dr. Hiroshi Nawata, Associate Professor of Research Institute for Humanity and Nature delivered lectures on " Japan’s Experience of Pollution Control " and "Environmental Conservation with Traditional Ecological Knowledge and Community Participation: Hima in the Middle East and Satoyama in Japan" using a video film. Around 50 persons including representatives of the government ministries, parliament, universities, industrial companies and NGOs attended the seminar and they have lively discussions with the lectures about the Japan’s experiences. Mr. Sohitsu Hachiya, 21st generation designate of the grand master of Shino School of Koh-do(Japanese Art of Appreciating Incense) and Special Advisor for Cultural Exchange appointed by the Japanese Government , visited Bahrain on 3rd March. Mr. Hachiya gave a presentation and demonstrated Koh-do for wives of Bahraini ministers and ambassadors accredited to Bahrain at the Japanese Ambassador’s residence in the morning of 4th March. In the evening, he also delivered a lecture with Koh-do demonstration in front of the Bahraini citizens at Isa Cultural Center. 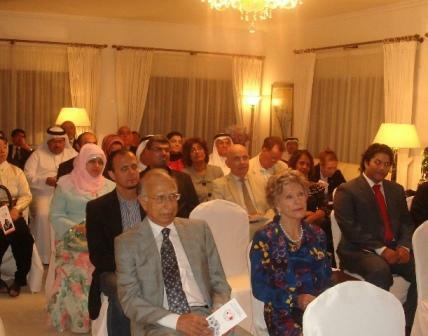 This event was held by the Embassy and the Bahrain-Japan Friendship Society under the patronage of H.H. Shaikh Abdullah bin Khalid Al Khalifa, Chairman of the Board of Trustees of Isa Cultural Center. 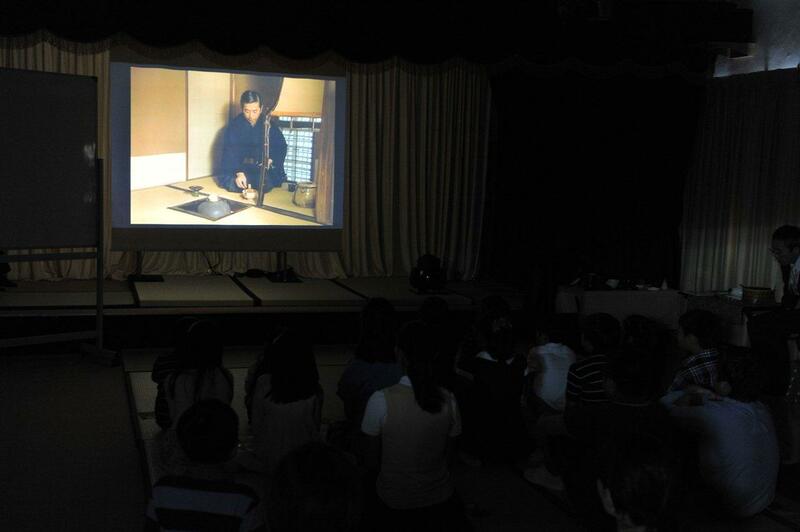 More than 100 people who attended the event enjoyed Japanese traditional aroma of precious aromatic wood, Jin-Koh. Mr. Hamad Fuad Akhtar, from Syed Junaid Alam W.L.L. also gave a presentation about the Bahraini incense, oud. 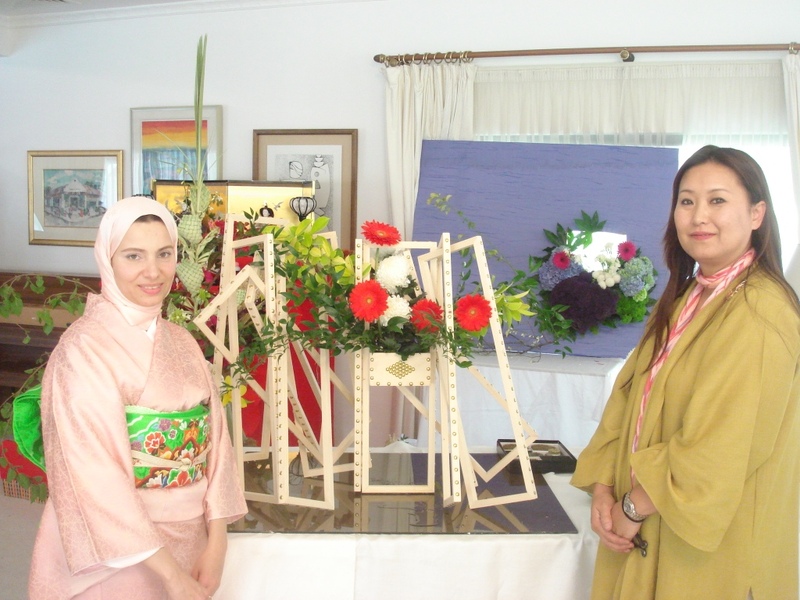 The Embassy of Japan displayed an artistic Ikebana flower arrangement and presented demonstrations of Ikebana at the Bahrain International Garden Show (BIGS) 2010 from 25 th to 28 th February in cooperation with the Bahrain-Japan Friendship Society. 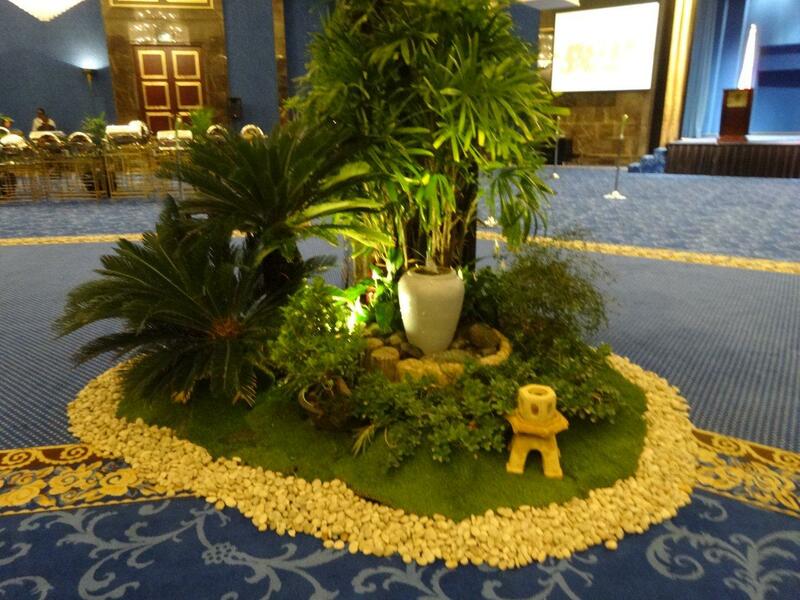 The displayed Ikebana work was designed by Mrs. Yuko Mizuguchi, Japanese Sogetsu Ikebana artist. 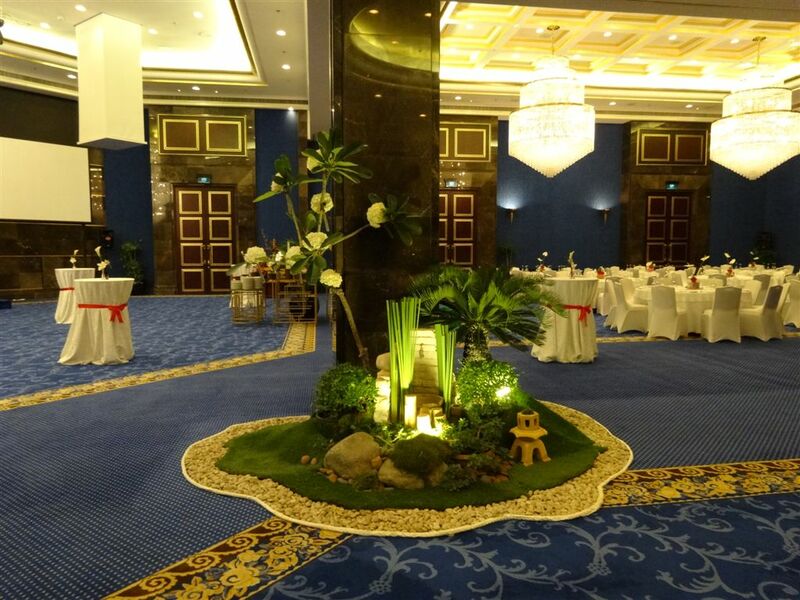 It symbolized the friendship between Japan and Bahrain being composed of bamboo and palm tree, each of which has been traditionally important material in Japan and Bahrain respectively. Many visitors were fascinated with its concept and unique shape. Mrs. Mizuguchi also demonstrated how to make Ikebana flower arrangement by using flowers and plants available in Bahrain in front of an attentive audience. In total more than 200 visitors were amazed by the beauty of this art. The Japanese booth was selected as one of the best in show exhibits at BIGS2010. 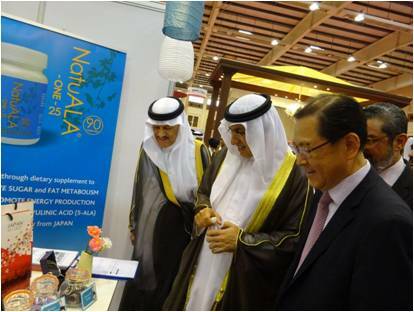 The 18th the GCC-Japan Environmental Symposium entitled “Environment & Water Resources for Our Future” was held with the strong support of the Bahrain Center for Studies and Research on 8th and 9th of February. The Symposium takes place every year in one of the GCC countries with the support of Japan Cooperation Center, Petroleum (JCCP) and its GCC counterparts. In the Symposium, government officials, experts and researchers from Japan and the GCC countries discussed various measures to tackle with environmental issues such as CO2 emission reduction technology and effective utilization of water resources. 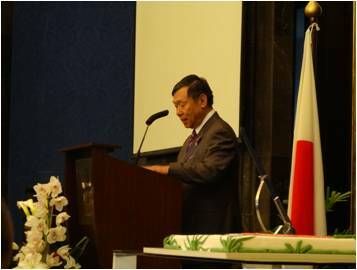 The Japanese Ambassador H.E Hideo Sato stressed the importance of enhancing cooperation between Japan and the GCC countries in his speech in the opening session, especially in the fields of energy conservation, new and renewable energy as well as water recycling, where Japan has developed advanced technologies. More than 200 people attended the Symposium, and interacted with the speakers in lively Q & A sessions. Ambassador Hideo Sato hosted a reception inviting members of the Bahrain Japan Friendship Society (BJFS) at the Ambassador’s residence on January 11, 2010. 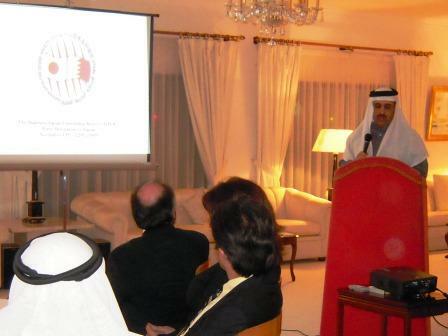 At the reception, Mr. Nasser Al-Arayedh, 2nd Vice-President of BHFS, made a presentation on the BJFS delegation’s visit to Japan, which took place from 14th to 22nd of November, 2009. He outlined outcomes of the delegation’s meetings with Former Prime Minister Yasuo Fukuda, Mr. Tsutomu Takebe, President of the Japan-Bahrain Parliamentary League, high-ranking Japanese Government officials such as Mr. Teruhiko Mashiko, State Secretary for Economy, Trade and Industry and Mr. Shuji Kira, Parliamentary Vice Minister for Foreign Affairs, top managements of government-affiliated organizations such as JETRO and JBIC as well as private companies including the BJFS’s Japanese member companies. Following the presentation, Mr. Mubark Kanoo, President of BJFA, presented gifts to the Ambassador in appreciation of the support provided by the Japanese Government in making the BJFA delegation’s visit a success. Twelve Bahraini youths, selected out of about 70 contestants, received their air tickets to Japan from Ambassador Sato to participate in the 22nd Ship for World Youth (SWY) Program on Thursday, 7th January, at the Embassy. The delegation, headed by Mr. Mohammad Ali Ahmadi, will be leaving for Japan on 11th January to board the Youth Ship together with 135 Japanese youths and other 132 fellow participants from 11 countries. A month and a half long voyage will take those young people on board to the Southwest Asia, Africa and the Middle East from 22nd January to 5th March. 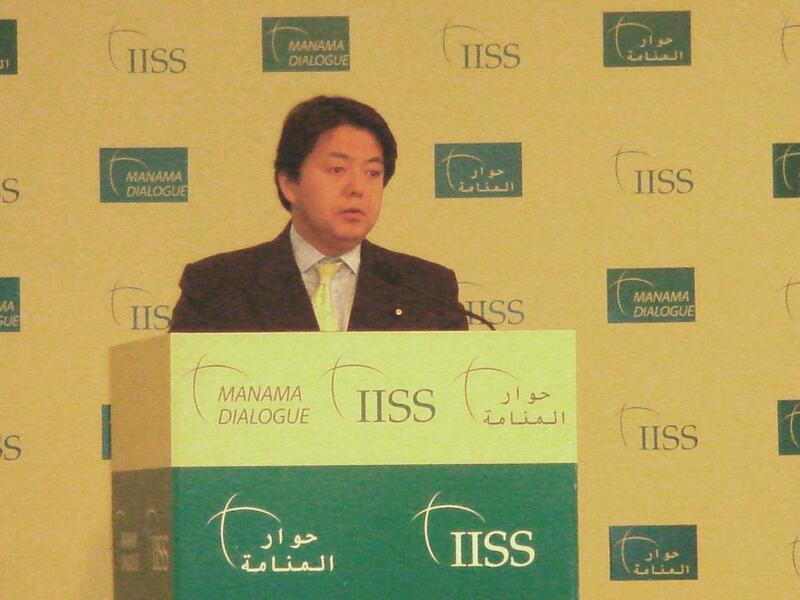 H.E.Mr.Kazuya Shimba, Parliamentary Senior Vice-Minister of Defense participated in the 6th Regional Security Summit “the Manama Dialogue”, which was organized by IISS (International Institute for Strategic Studies) from 12th to 14th of December, 2009. H.E.Mr.Kazuya Shimba delivered a statement entitled “Japan’s Efforts towards the Elimination of Nuclear Weapons”. He also had meetings with H.E.Sh Khalifa bin Ahmed Al Khalifa, Commander in Chief of the Bahrain Defense Forces, H.E.Sh.Khalid bin Ahmed Al Khalifa, Minister of Foreign Affairs and other participants of the Dialogue. 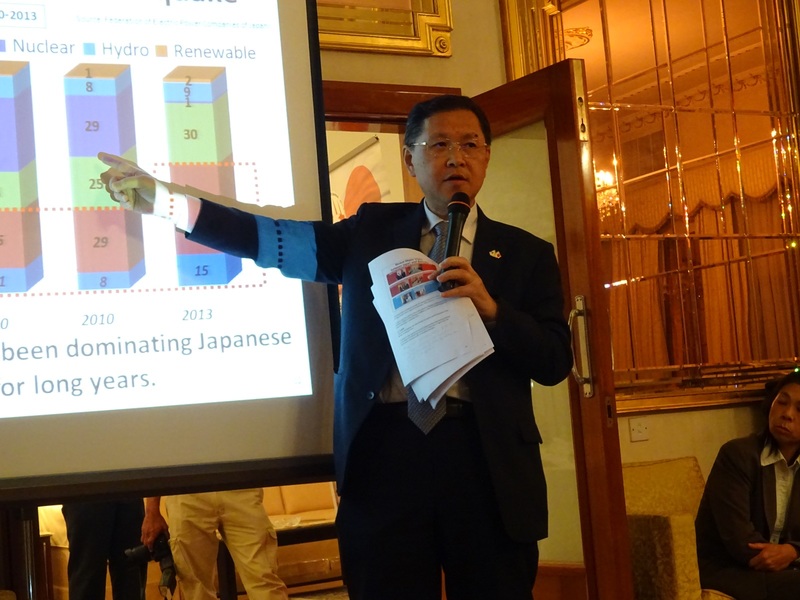 On 9th December, Dr. Hisashi Ishitani, director of New Energy Promotion Council gave a lecture entitled “Policy and Measures for Energy Conservation and Promotion of Renewable Energy in Japan ” at the Bahrain Society of Engineering. The lecture meeting was held u nder the patronage of H.E. Dr. Abdul Hussain bin Ali Mirza, the Minister of Oil and Gas Affairs and Chairman of National Oil and Gas Authority in cooperation with the Bahrain Japan Friendship Society. More than 150 people who are interested in energy issues and environment attended the lecture meeting. Dr. Ishitani also another lecture to government officials and researchers of universities at the Bahrain Center for Studies and Research on 10 th December. The participants were so keen on learning Japna’s latest technology, its experience and know-how in the field of energy conservation and renewable energy. 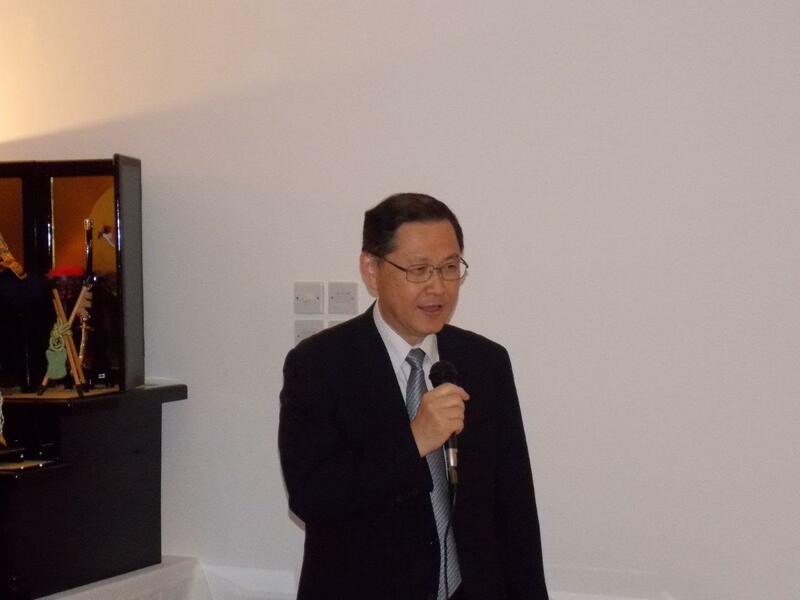 On December 7th, Ambassador H.E.Hideo Sato hosted a reception to celebrate His Majesty the Emperor ’ s 76 th Birthday. His Highness Shaikh Khalifa bin Ali Al Khalifa attended the reception on behalf of H.R.H.Prime Minister Prince Khalifa together with His Highness Shaikh Isa bin Ali Al Khalifa. More than 400 distinguished guests including ministers, dignitaries of various sectors of Bahrain and representatives of Japanese companies gathered to celebrate the upcoming birthday of His Majesty the Emperor on December 23rd. On 20th November, the annual Aki Matsuri, or Autumn Festival, was held by the Japanese Society in Bahrain at the Japanese School in Sarr. Originally, the autumn festivals were held all over in Japan in thanksgiving for a plentiful harvest of the year. The happy event drew more than 1,000 Japanese, Bahraini and international participants, who enjoyed Japanese foods and games at the open-air booths set up in the school yard as well as entertainments such as demonstration of traditional rice cake making, traditional festival dances and folk music in a truly “Japanese” atmosphere. 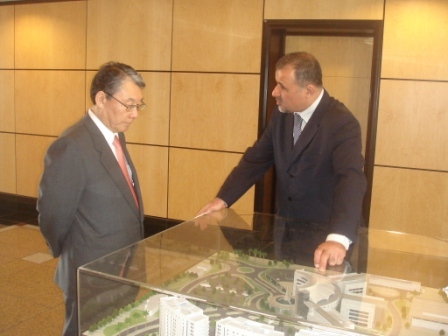 On November 18, Ambassador Sato received Dr. Ali Hasan Follad, Advisor to the Minister of Industry and Commerce. Dr. Follad presented a copy of his latest published book “Mosaic - A Journey through the Multi-faced World of Bahrain’s Arts and Crafts”. The book offers wealth of information on traditional and modern handicrafts in Bahrain. By invitation of the Japanese Government, Ms. Khulood Jassim Mohammed Sanad, Senior Educational Specialist of Ministry of Education, is visiting Japan to take part in the “Training for GCC Educationalists 2009” from 8th to 21st of November 2009. This program is designed to provide opportunities for her as well as other participants from Kuwait, Oman, Qatar Saudi Arabia and UAE to get first-hand knowledge about Japan’s educational system including education methods, teacher training and effective school management by visiting various public and private schools, lectures and discussions with their counterparts. The program also includes visits to institutes for multimedia education and e- learning. On 12 November, Tamkeen and JCCME(the Japan Cooperation Center for the Middle East) in cooperation with the Japanese Embassy held a workshop on Kaizen Management at the Intercontinental Hotel. The lecturer, Prof. Seiichi Fujita of Waseda University. explained the Kaizen management method, a unique Japanese way to improve efficiency and productivity, illustrating with a variety of examples from Japan and the rest of the world. 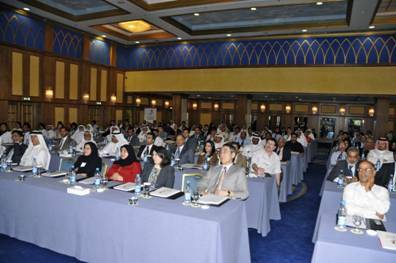 More than 150 businessmen and businesswomen from the private sector attended the workshop. 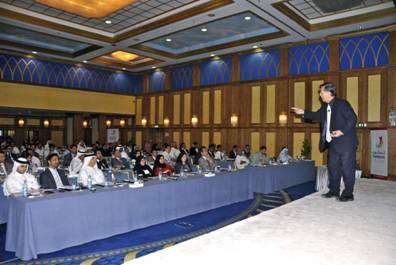 This is the third consecutive year that the workshop has been taken place in Bahrain. By invitation of the Japanese Government, Mr. Ali Abdullatif, Acting Head, Operations, Electricity Conservation Department of Electricity and Water Authority goes to Japan to take part in the “Middle East Group Study Program 2009” from 1st to 21st of November 2009. 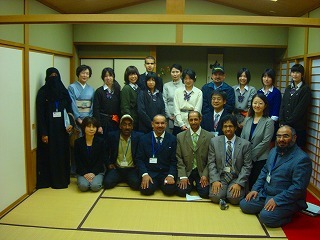 Fifteen participants in the program, including Mr. Abdullatif, from the Middle East and North African countries are expected to get first-hand knowledge about Japanese environmental efforts such as future-oriented eco-business and development of environmental technologies towards establishing a sustainable society through a series of lectures, presentations, field trips and discussions organized around the overall theme of “Industrial Development and Environment”. On October 15 th, Eisai, one of the major Japanese pharmaceutical companies, established its new office in Bahrain, the first one in the Gulf region. 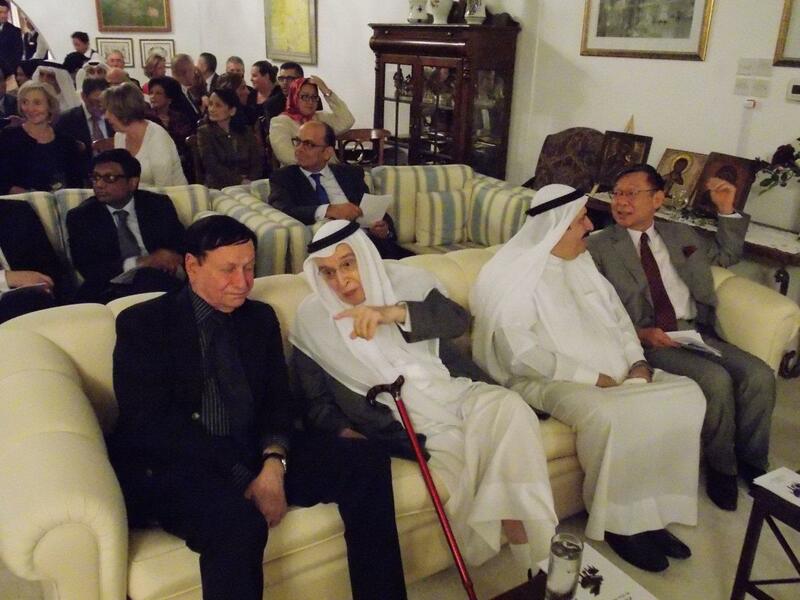 The opening ceremony　was attended by a representative of the Bahrain Economic Development Board and other guests. With Eisai Co.,Ltd. 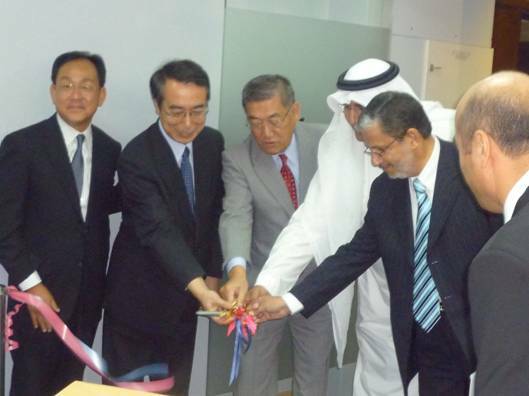 opening the office, the number of Japanese companies that have offices here in Bahrain has reached 16. The Embassy of Japan donated books and magazines on Japan in Arabic to the Ministry of Education on 13th October, which will soon be available to the Bahraini readers at the public libraries in Isa town, Muharraq and the other areas. Those books, originally written by Japanese scholars and magazines cover a wide range of subjects on Japan such as Japanese history, culture, economic development, etc. 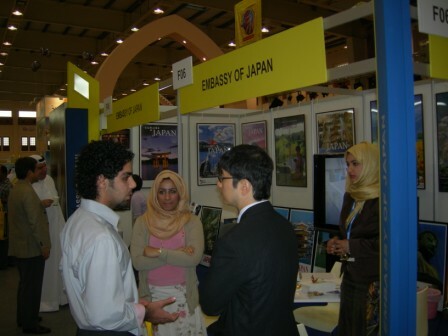 and are designed to provide opportunities to the Bahraini public to learn about different aspects of Japan. H.E. Mr. Hideo Sato Ambassador-Designate handed over an air ticket to Mr. Mustfa Abdulnabi Dhaif Ali Husain on Tuesday, 29th September. He will leave for Japan on 1st October to study at a Japanese university on the Japanese Government Scholarship Program for 2009.Mr. Mustfa Abdulnabi Dhaif has been accepted to study electrical engineering at Osaka University as a research student. He is expected to stay in Japan for a period ranging from 3 to 4 years to obtain his Ph.D.
Mr. Mustfa Abdulnabi Dhaif obtained his Master degree in Electrical and Electronic Engineering at the University of Leicester in 2003 and returned to Bahrain to be Senior Lecturer at Bahrain Training Institute. Two Bahraini students have received the Japanese Government Scholarship for the year 2009, the other recipient is already studying at Tohoku University for his master degree. The Government is screening candidate for the year 2010. 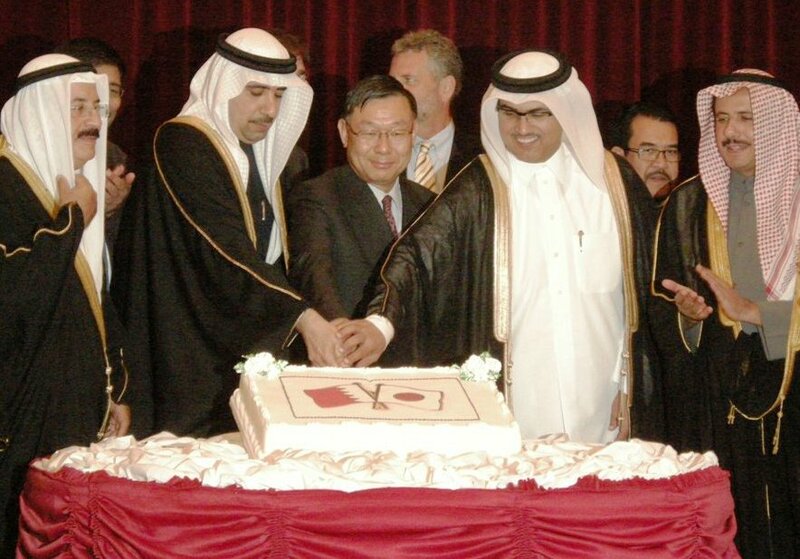 The Japanese Government has been providing scholarships to Bahraini students since 1994. More than 20 students were given opportunities to study at Japanese universities and seven Bahraini students are currently studying in Japan. The Embassy will release details of the Japanese Government Scholarship Program for 2011 in April 2010. On 4th of August, H.E. 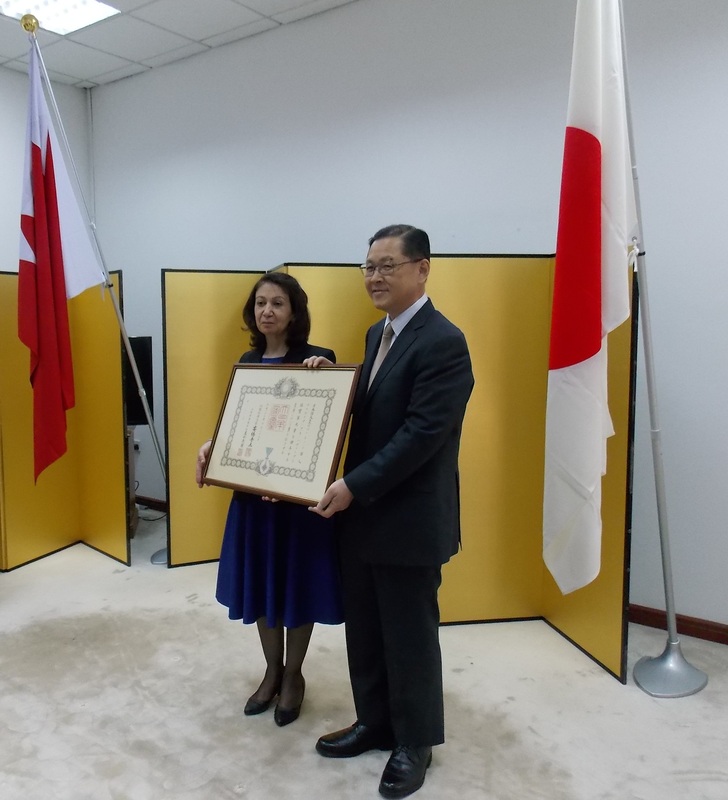 Mr. Takeshi Kondo, Ambassador of Japan was decorated with Bahrain First Class Medal of Honor in recognition of his role in enhancing bilateral relations between Japan and the Kingdom of Bahrain. His Highness Shaikh Salman bin Hamad Al Khalifa, the Deputy King　（Crown Prince） awarded him the Medal on the same day. On the occasion of completion of his assignment, H.E. Mr. Takeshi Kondo, Ambassador of Japan in the Kingdom of Bahrain held a press conference on 28th July 2009 at Embassy premises. 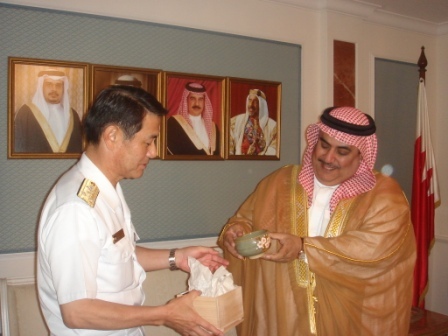 He reviewed his tenure and expressed the 2008 statistic figures of the trade between Bahrain and Japan in 2008. H.E. Mr. Takeshi Kondo, Ambassador of Japan in the Kingdom of Bahrain hosted a reception and screening of the Japanese classic film ”Sanjuro” on 23rd July 2009 at his residence. Officials, members of the Bahrain Japan Friendship Society and other invited guests attended and enjoyed watching the film which is the first-rate Japanese Samurai film by world renowned writer producer and director Akira Kurosawa who won Oscars. H.E. Mr. Takeshi Kondo, Ambassador of Japan, received on 12th July Mr. Hafedh Ebrahim Aldoseri, member of the Bahrain Football Association (BFA), executive committee and head of the junior football team delegation, and other BFA officials with ten junior players at Japanese Embassy premises. Bahrain junior football delegation will participate in “Saitama International Junior Tournament 2009” which is held annually in Saitama Prefecture, Japan for football teams with players aged 12 years old or younger. This year, the tournament will be held on July 24th-26th. Eight foreign teams including the Kingdom of Bahrain and sixteen Japanese junior teams are participating. The Ambassador expressed his hope that every player does his best in every game on behalf of Bahrain and wished it success. The delegation will leave for Japan on 20 th July. H.E. 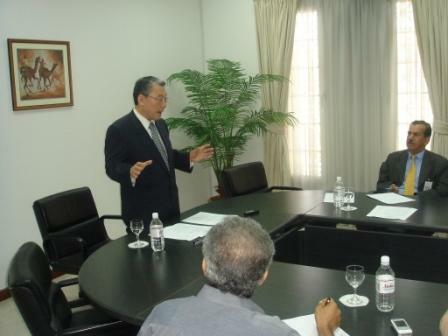 Mr. Takeshi KONDO, Ambassador of Japan, visited the Craft Industries Development Center on 7 th of July 2009. 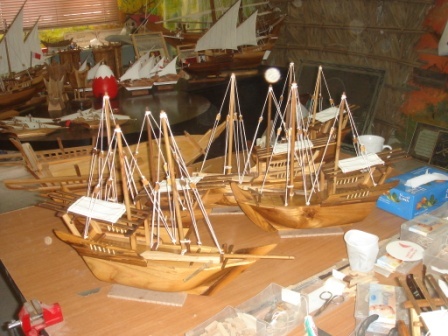 Many goods are displayed by Palm Tree Paper Project of Mother and Child Society, and Bahraini craftspersons and artists. The Ambassador was impressed by the handicrafts, and watched the process of manufacture. 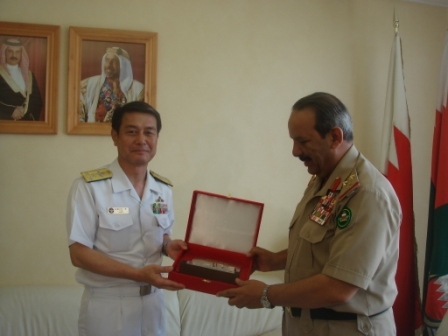 Vice Admiral Tohru IZUMI, Commander in Chief of the Japan Self Defense Fleet visited the Kingdom of Bahrain form 17 to 18 June, 2009. During the visit, H.E.Mr. Takeshi KONDO, Ambassador of Japan and VADM IZUMI paid courtesy calls to H.E. Gen. Sh. Khalifa bin Ahmed Al Khalifa, Commander in Chief of Bahrain Defense Force, H.E. LT. Gen. Dr. Sh. Mohammed bin Abdullah Al Khalifa, Minister of State for Defense Affairs, Brigadier General Abdulla Saeed Al Mansoori, Commander of Bahrain Royal Naval Force, H.E.Sh.Khalid bin Ahmed Al Khalifa, Minister of Foreign Affairs and Vice Admiral William E.Gortney, Commander of Combined Maritime Forces, and discussed counter terrorism and counter piracy measures. 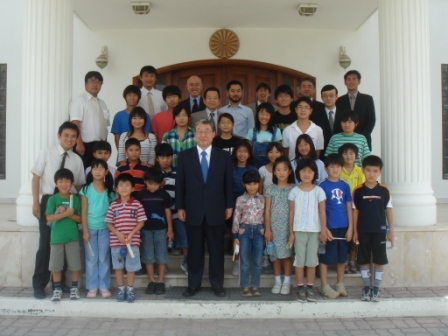 Students and teachers of Japanese School in Bahrain visited Embassy of Japan on 15 th June, 2009. They were briefed on work of the embassy by diplomats after touring around the embassy. Then, they were entertained by a DVD movie and took photo together with H.E. 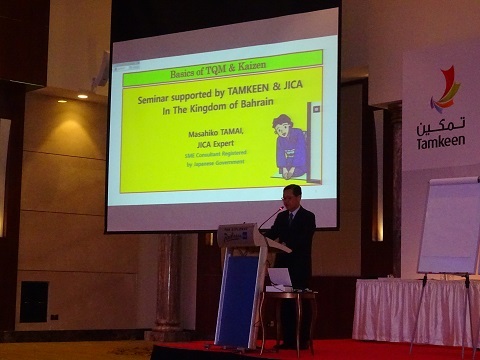 Mr. Takeshi KONDO, Ambassador of Japan to the Kingdom of Bahrain. On June 10 th, H.E. Mr. Takeshi KONDO, Ambassador of Japan to the Kingdom of Bahrain received Mr. Ahmed Mohamed Hakeem Alteraifi who has successfully completed his study in Japan. Mr. Alteraifi, a diplomat of Ministry of Foreign Affairs of the Kingdom of Bahrain, joined the Japanese-Language Program for Foreign-Service Officers provided by the Government of Japan. He had been in Japan for eight months (from October 2008 to late May 2009). The program included the study of practical Japanese language, culture and society of Japan, in addition to intensive language lessons. The Program provides the participants with various courses on Japan, including lectures on Japan's foreign policy, field trips to various places in Japan, weekend excursions and home stays, in order to deepen the understanding of Japanese culture. H.E,Mr.KONDO praised Mr. Alteraifi’s great effort and wished him further success, and thanked his great contribution to enhance Japan-Bahrain bilateral relations. H.E. Mr. Takeshi KONDO, Ambassador of Japan to the Kingdom of Bahrain, and his wife Mrs. Hiroko KONDO donated to the Bahrain Society for Children with Behavioral & Communication Difficulties (Alia for Early Intervention). H.E. Mr. KONDO was delighted to hand over the donation cheque to Shaikha Rania bint Ali Al Khalifa, Secretary General of the Society. He had also an honor to receive a precious gift from Alia School, a picture painted by a student of the School. The amount was raised by wives of Japanese diplomats through their activities made in cooperation with the Japanese School in Bahrain. Mr.Yuichi YOSHIKAWA, the principal of Japanese School and his wife Mrs. Eriko YOSHIKAWA, and wives of Japanese diplomats also joined the occasion. On June 2, the Japan Bank for International Cooperation (JBIC) signed a Memorandum of Understanding (MOU) on a Comprehensive Strategic Partnership with the Government of Kingdom of Bahrain(The signing took place between Mr. Hiroshi Watanabe, JBIC CEO and H.E. Mr. Aref Saleh Khamis, Undersecretary of the Ministry of Finance of Bahrain). H.E. Mr. Takeshi Kondo, Ambassador of Japan, has welcomed this announcement, saying that this MOU will further strengthen the bilateral relations and cooperation between the Kingdom of Bahrain and Japan. He is confident that this strategic partnership will bring forth tangible results in developing economic and industrial opportunities for the mutual benefit of both countries. H.E. 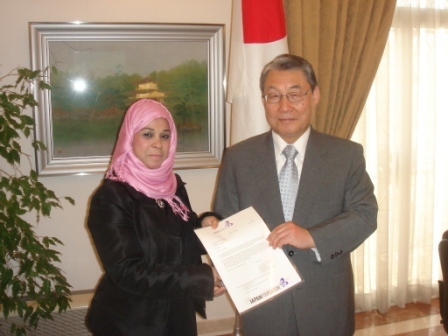 Mr. Takeshi Kondo, Ambassador of Japan, handed over a grant letter of the Japan Foundation’s fellowship program to Mrs. Afaf Mubarak Bukhawa, teaching assistant in technology management at the Arabian Gulf University on Sunday, 31 st May at Embassy premises. She will leave for Japan on 27 th June to conduct her research at a Japanese university for 2 months as researcher of Japan Foundation’s Fellowship Exchange 2009-2010. Her research theme entitled “Information and Communication Technology and Gender in the Japanese University. Case Study: University of Electro Communication”. Passengers arriving from the United States of America (mainland only), Canada and Mexico will undergo an on-board quarantine check upon arrival ONL Y when a passenger with influenza-like symptoms has been reported in flig ht. Close contacts (passengers seated nearby) of a confirmed patient will be monitored at a designated healthcare facility. No detainment measures will be taken. �@ an on-board quarantine check will be conducted in order to detect other passengers with influenza-like symptoms and to identify their close contacts (as above). All other passengers will disembark and proceed to a quarantine station to undergo a thermography test as well as to fill in a questionnaire. �A close contacts (as above) will remain seated until checked by a quarantine officer with a questionnaire. Close contacts (as above) will be monitored after entry. �B Passengers with influenza-like symptoms will be isolated at a designated medical facility if tested positive. �@ quarantine officers will board the aircraft and request all the passengers to complete a questionnaire. �A if no influenza-like symptoms are reported, the passengers will disembark and proceed to a quarantine station to undergo a thermography test and hand in the completed questionnaire. Passengers will disembark, proceed to a quarantine station to undergo a thermography test and hand in the completed questionnaire. Health Monitoring: a local healthcare facility near your hotel or residence will monitor your health for a designated period after your entry into Japan. On Saturday 23rd May 2009, H.E. Mr. and Mrs. Kondo presented to the winner, Mrs. Faiqa Al Awadhi on behalf of her sister, Mrs. Nabila Ancy Johnson a trophy of Japanese Ambassador Award, Ikebana Class, which is one of the categories of the Bahrain Garden Club’s 44th Annual Flower and Vegetable Competition. 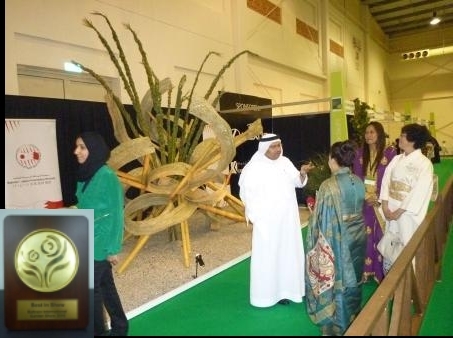 The Show was one of the features of the Riffa Views Bahrain International Garden Show (RVBIGS) held at Bahrain International Exhibition and Convention Center last month. Other winners received trophies and certificates from H.E. Shaikh Humood bin Abdulla Al Khalifa, Capital Governor and H.E. Mrs. Shaikha Maram bint Isa Al Khalifa, head of RVBIGS organizing committee. The Japan Training Squadron of Japan Maritime Self-Defense Force(3 ships, Kashima, Shimayuki and Yuugiri) visited the kingdom of Bahrain form 16 May to 19 May, 2009.During the trip, the Squadron visits Asia, Middle East and Europe, to develop the seamanship and leadership skills of future leader of Japan Maritime Self-Defense Force. 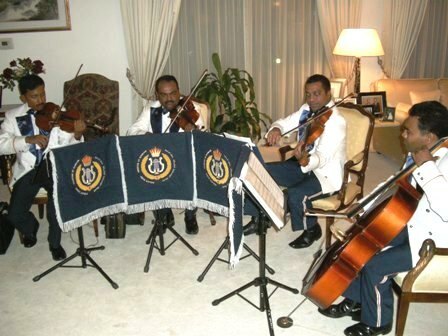 In Bahrain, the Commander of the squadron paid courtesy calls to the leaders of Bahrain Defence Forces and Bahrain Royal Navy, and the Governor of Central Governorate and held a reception and a joint musical concert with the Band of the Bahrain Defence Forces and martial arts performances. H.E.Mr Takeshi Kondo made a lecture to the future leaders. From 14 th to 16 th May, the Embassy of Japan organized a Japanese booth at the occasion of the 5 th Bahrain International Travel Expo in an attempt to promote tourism to Japan, with contributions provided by Kanoo Travel , which is a major travel agent in Bahrain and Rouben Store (Sharp agent) The booth showed DVDs of the country’s tourist spots by Sharp large-screen TV and displayed panels of Japan’s sceneries alongside a collection of brochures of sites such as Tokyo, Osaka, Kyoto, Nara, Toyama, Shizuoka and Hokkaido and attractions and the package tour to Japan provided by Kanoo Travel. Japanese tea (Shizuoka Tea) was also offered to visitors, who enjoyed warm hospitality. Many visitors came to the Japanese booth and showed their interest in visiting Japan. H.E. 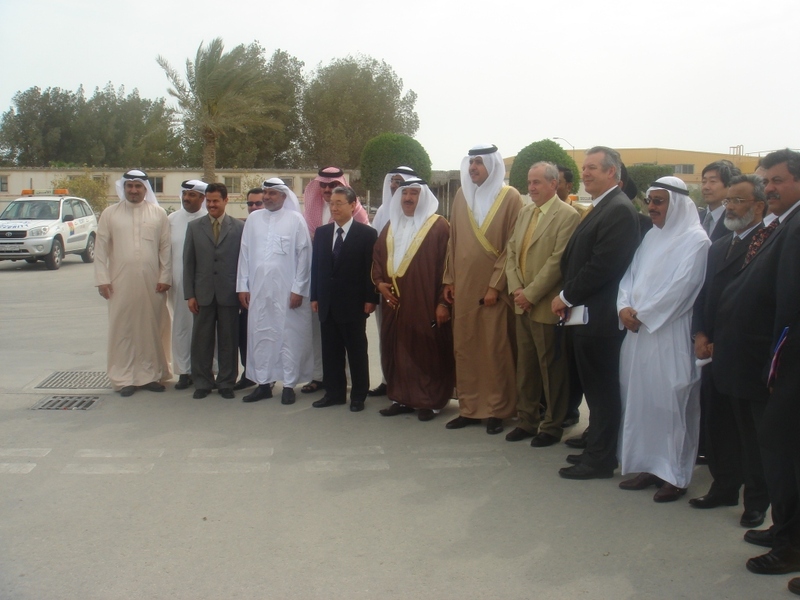 Mr. Fukuda, Special Envoy of Prime Minister Taro Aso, Former Prime Minister, Member of the House of Representatives, visited the Kingdom of Bahrain from 13 th to 15 th May, 2009. During his visit, he was received by His Majesty King Hamad bin Isa Al Khalifa, and presented to His Majesty a personal letter from the Prime Minister of Japan. He also met His Highness Shaikh Salman bin Hamad Al Khalifa, Crown Prince and Deputy Supreme Commander, H.E. Shaikh Khalid bin Ahmed Al Khalifa, Minister of Foreign Affairs, H.E. Shaikh Ahmed bin Attiyatallah Al Khalifa, Minister of State for Cabinet Affairs, H.E. Mr. Ali bin Saleh Al Saleh, Chairman of the Shura Council, H.E. Mr. Khalifa bin Ahmad Al Dahrani, Chairman of the Council of Representatives, H.E. Dr. Hassan bin Abdulla Fakhroo, Minister of Industry and Commerce, Mr. Mubarak Jassim Kanoo, President of the Bahrain-Japan Friendship Society and representatives of the Japan Society. Under the auspices of the Culture and National Heritage Sector of the Ministry of Culture and Information, the Embassy of Japan in the Kingdom of Bahrain will organize a cultural event in cooperation with the Bahrain-Japan Friendship Society.It will be held on the occasion of the visit of Training Squadron of Japan Maritime Self Defense Force to the Kingdom of Bahrain. They will present the musical band, Japanese traditional drums (Wadaiko) and Japanese martial arts performances. At this event, the musical band of Bahrain Defence Force will join to perform. The event will take place at the Cultural Hall on Monday 18th May 2009 at 8:00p.m. All are welcome. For further information, call the Embassy on 17716565. 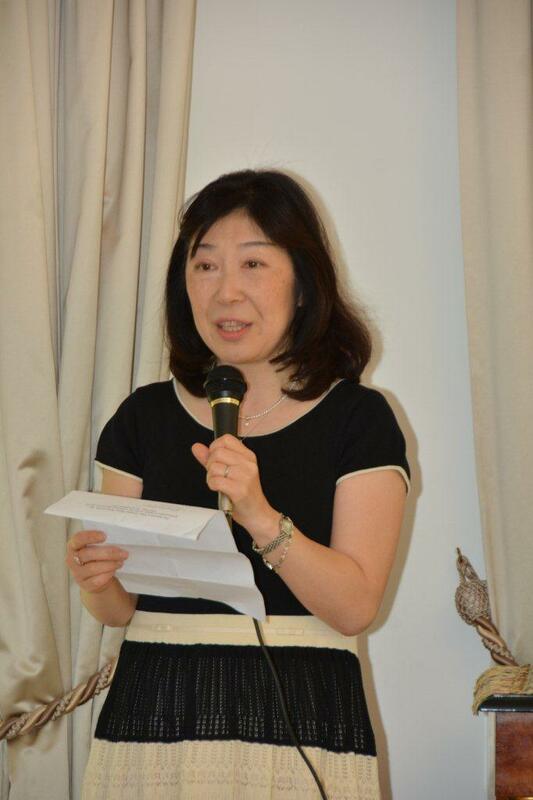 On 11 th May 2009, Mrs. Hiroko KONDO, wife of the Ambassador of Japan, and wives of Japanese diplomats, donated to the Mother and Children Welfare Society their proceeds of 28 th International Embassy’s Bazaar which was held by the Society. Mrs.KONDO was pleased to hand over the donation to Shaikha Hind bint Salman Al Khalifa, President of the Mothers and Children Welfare Society. 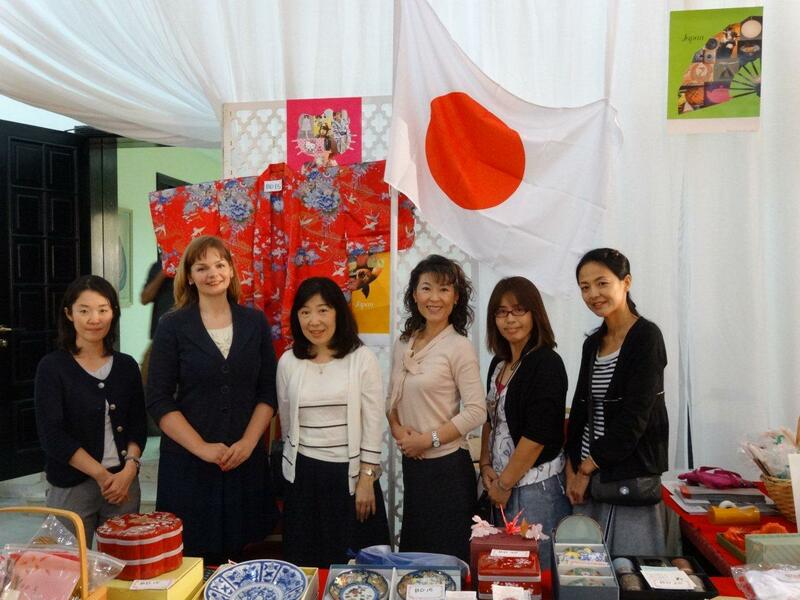 Mrs.KONDO, wife of Ambassador of Japan to the Kingdom of Bahrain, and wives of Japanese diplomats participated in the Bazaar and sold Japanese traditional vases, tableware and some handmade goods and other goods at the Japanese booth on 29 th March 2009. It was well received by visitors. H.E. Mr. Takeshi Kondo, Ambassador of Japan was presented a report of master’s thesis entitled "Creating a Braudelian Gulf: A New Skeleton for an Old Body(of History)", by Japanese government scholarship student, Mr. Hasan Hejairi on Tuesday, 28th April at Embassy premises. 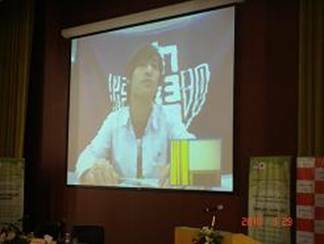 Mr. Hejairi obtained his master’s degree in economics at Hitotsubashi University in Japan in March 2009. He majored in economic history and regional economics. He went to Japan in April 2005, after graduating from Drake University in the United States. Mr. Hejairi is going to continue his studies in Exeter University in the United Kingdom to obtain his Ph.D. in October. During the meeting, the Ambassador praised Mr. Hejairi’s diligent efforts in Japan, wished him every success and expressed the hope that Mr. Hejairi would continue to excel in his present and future assignments. Mr. Hejairi expressed his deepest gratitude to the Ambassador for supporting his studies in Japan and his desire to participate actively in developing relations between Japan and the Kingdom of Bahrain. 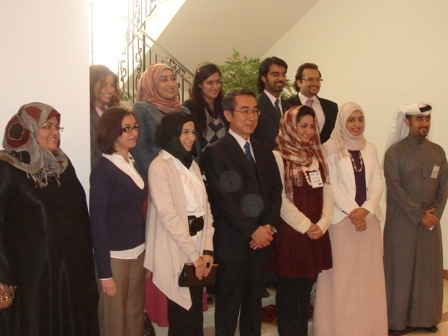 The Japanese Government Scholarship Program has been offered in Bahrain since 1994. More than 20 students were given opportunities to study at prestigious Japanese Universities. Currently, six Bahraini students are studying in Japan. 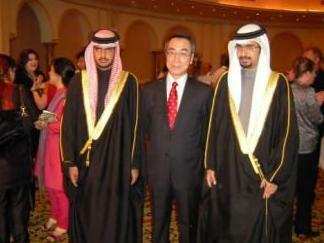 The Japanese Government selected two Bahraini candidates in this program for the year 2009. One candidate left for Japan in April to obtain his master’s degree and another candidate will leave for Japan in October 2009 to obtain his Ph.D. The Embassy of Japan is currently inviting Bahraini students to apply for the Japanese Government Scholarships for 2010 in coordination with the Ministry of Education. H.E. Mr. Takeshi Kondo, Ambassador of Japan to the Kingdom of Bahrain, visited Royal Collage of Surgeons in Ireland (RCSI) Bahrain on 7th April. 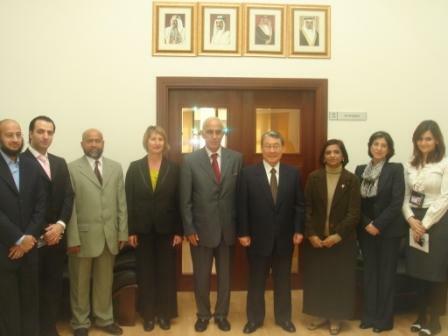 He discussed with Prof. Kevin O’Malley, President of RCSI Bahrain, and other officials about medical situation in Bahrain. H.E. toured the site after the discussion escorted by Mr. Riyadh Ali Dhaif, Deputy Registrar. H.E. 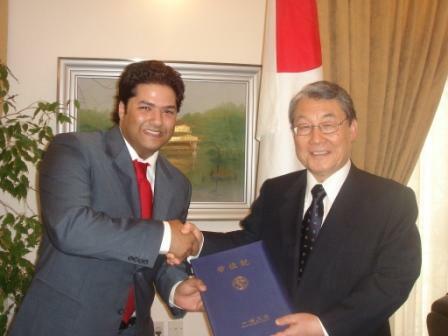 Mr. Takeshi Kondo, Ambassador of Japan, handed over an air ticket to Mr. Ahmed Ebrahim Abdulla on 30th March. He will leave for Japan on 1st April to take part in the Japanese Government Scholarship Program. Mr. Abdulla has been accepted to study information technology at Tohoku University as a research student. He is expected to stay in Japan for a period ranging from 2 to 3 years to obtain a Master Degree. During the meeting, the Ambassador expressed hope that Mr. Abdulla would utilize his ability to the fullest while in Japan and wished him every success. Mr. Abdulla graduated from Jordan University of Science and Technology in 2008 and returned to Bahrain to be a web project developer of a telecommunications company. 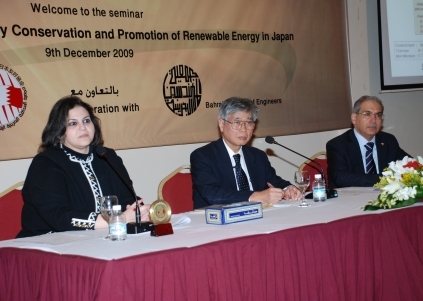 Japanese Government selected two Bahraini candidates in this program for the year 2009. Another candidate will leave for Japan in October 2009 to obtain his Ph.D. 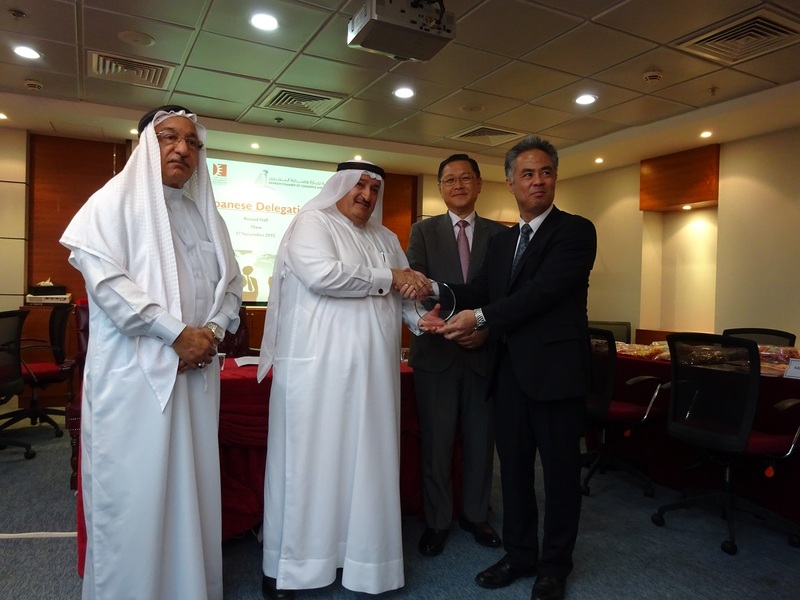 The Japanese Government Scholarship Program has been offered to the Kingdom of Bahrain since 1994. More than 20 students were given opportunities to study at Japanese universities. Currently, six Bahraini students are studying in Japan. 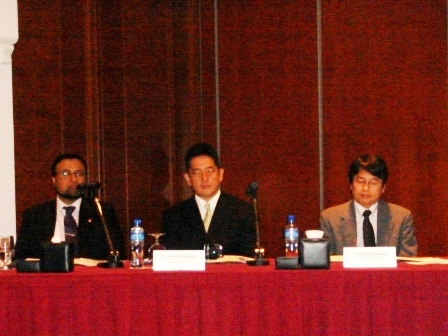 The Embassy will release details of the Japanese Government Scholarship Program for 2010 in April 2009. 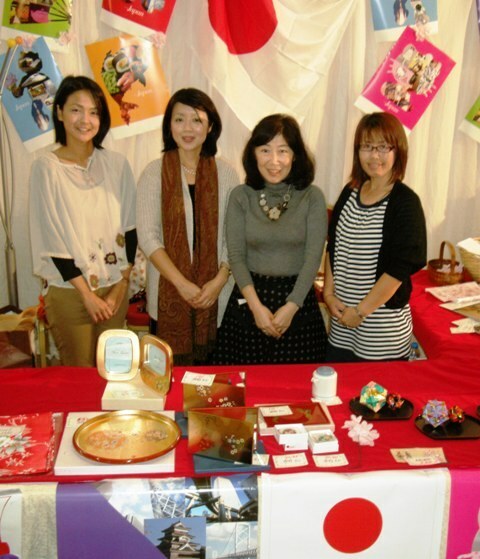 On March 29th, Mrs. Hiroko KONDO, wife of Ambassador of Japan to the Kingdom of Bahrain, and wives of Japanese diplomats participated in the International Embassy ’ s Bazaar which was held by the Mother and Children Welfare Society. Japanese traditional vases, tableware and some handmade goods and other goods were sold in the Japanese booth sold and well received by visitors. 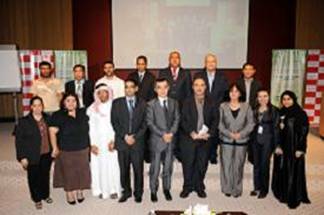 Bahraini scholar, Mr. Ahmed Bucheeri, received his PhD. in Mechanical Engineering from Ibaraki University of Japan in March 2009. Mr. Ahmed Bucheeri's dissertation is titled “ Studies on Micro Bubbling Elements in Mercury Targets for Pulsed Spallation Neutron Sources” . After graduating from University of Bahrain, Mr. Bucheeri went to Japan as a student sponsored by Japanese Government Scholarship in April 2003, and earned Master’ s degree in mechanical engineering in March 2006 at Ibaraki University. Al Hidd Power and Water Station was officially opened on the 18th of March by H.E. Eng. Fahmi Al-Jawdar, Minister of Works. The inauguration ceremony was attended by H.E. Mr. Takeshi Kondo Ambassador of Japan. Sumitomo Corporation, a Japanese company has an invested interest in this project. The Power and Water station will be making a contribution of 63% to Bahrain's water network. On Thursday, 5 th March, 2009, Mrs. Hiroko Kondo, wife of Ambassador of Japan to the Kingdom of Bahrain, held a Japanese Flower Arrangement (IKEBANA) Demonstration and Japanese Dolls Festival or Momono-Sekku (Peach Blossom’s Festival) at her residence in Bar Bar, as part of JUSOOR PROGRAM of the Ministry of Foreign Affairs, Kingdom of Bahrain. H.E. Shaikha Wesal bint Mohammed Al Khalifa, wife of Minister of Foreign Affairs and President of Jusoor Program, wives of Ambassadors, and other invited guests attended the event. Mrs. Yuko Mizuguchi, a registered teacher and a member of Ikebana International gave a demonstration of five big flower arrangements for the guests. Some of the guests have also enjoyed making their own Ikebana arrangements by using gift bags and tall glasses. H.E.Mr.Yasutoshi Nishimura, Parliamentary Vice-Minister for Foreign Affaires visited the Kingdom of Bahrain from 1st to 3rd of March 2009,to participate in the international conference on “Human Trafficking at the Crossroads, Private-Public Partnership to Fight Human Trafficking”which was held under the patronage of H.H.Shaikha Sabeeka bint Ibrahim Al Khalifa, Wife of H.M.the King of Bahrain and Chairwoman of the Supreme Council for Women. Mr. Nishimura joined the first plenary session as a panelist, and explained the Japanese Government’s effort in fighting against human trafficking. During his stay, Mr.Nishimura paid a courtesy call to H.H. Shaikh. Salman bin Hamad Al Khalifa, Crown Prince and Deputy Supreme Commander, and met with H.E.Dr.Abdul-Hussein Mirza, Minister of Oil and Gas Affairs, H.E.Dr. 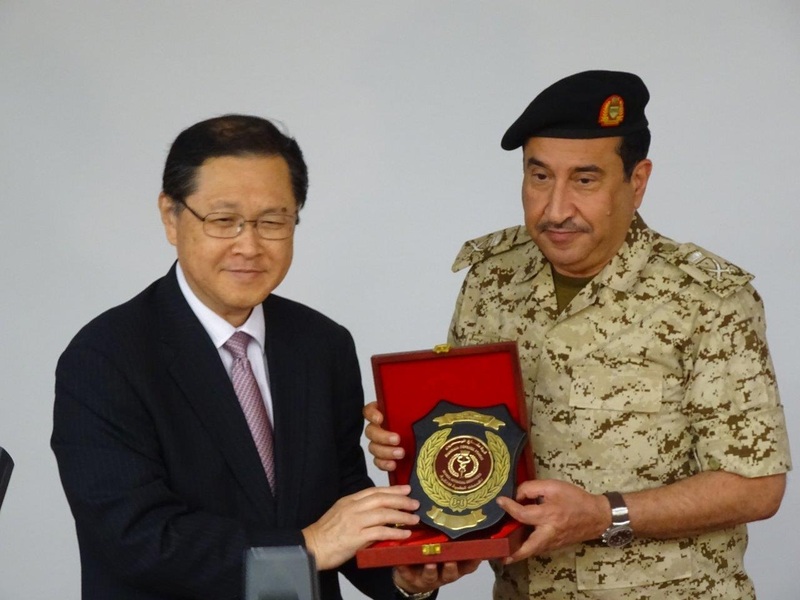 Nizar Al Baharna, Minister of State for Foreign Affairs, and visited the Headquarters of Combined Maritime Forces. He also met with H.E.Dr.Abd Thiab Al-Ajeeli, Iraqi Higher Education Minister, who was visiting Bahrain. 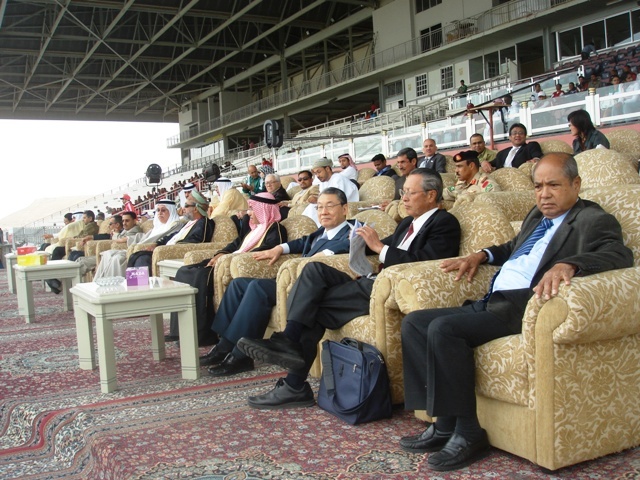 The 10th Asian Cross Country Championship was held on 1st of March 2009 at the Bahrain Equestrian Horse Racing Club under the patronage of H.H. Sheikh Nasser Bin Hamad Al Khalifa, President of the Royal Equestrian and Endurance Association at the Bahrain Equestrian Horse Racing Club. 147 athletes from 19 countries and regions participated in the championship. H.E Mr. Takeshi Kondo, Ambassador of Japan attended the opening ceremony and cheered the Japanese athletes. They put up brave fight and won a gold medal in senior women category, silver medals in junior men and junior women in the team category, also got bronze medals in senior women, junior men and junior women in the individual category. As the Ambassador of Japan to the Kingdom of Bahrain and as an honorary member, I am so honoured and delighted to be invited to the inauguration ceremony of Bahrain - Japan Friendship Society. The establishment of such society has been my dream since I arrived in the Kingdom at the end of April 2007. Therefore, I am more than happy to see the inauguration of the Society this evening and would like to convey my deepest thanks to Mr. Mubarak Jassim Kanoo, President of the Society, Mr. Kato, Deputy President, Mr. Nasser Al-Arayedh, Second Deputy President, Mr. Nabeel Ajoor and all the founding members for their sincere efforts to establish the Society. I also would like to express my deepest gratitude to the Government of the Kingdom of Bahrain for its support for the establishment of the Society. Especially, H.E. Shaikh Khalid bin Ahmed Al Khalifa, Minister of Foreign Affairs, was gracious enough to patronize this inauguration ceremony, and Shaikh Mohammed bin Isa Al Khalifa, Chief Exective of EDB, has always been cooperative. I hope that with broader participation from both Bahrainis and Japanese to the Society, it will keep active and contribute to further strengthen the relations between Japan and the Kingdom which received a big boost by the historic visit of H.H. Shaikh Salman bin Hamad Al Khalifa, Crown Prince and Deputy Supreme Commander, last year. 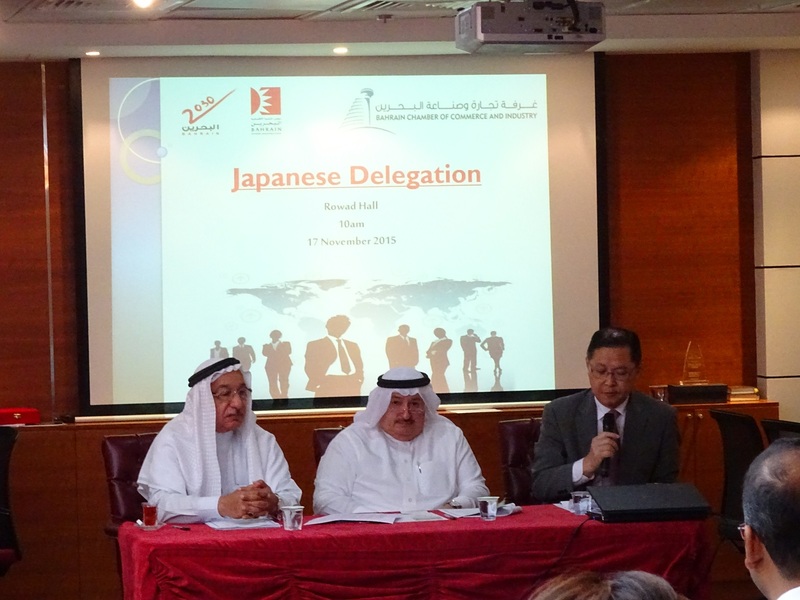 I wish the Bahrain- Japan Friendship Society every success and further advancement. H.E. Mr. Takeshi Kondo, Ambassador of Japan attended the opening ceremony of the 1 st Exhibition for the Exchange of Culture and Arts for Children of Toyama- Japan on 23 rd February in Salman Cultural Center organized by General Organization of Youth and Sports. Over eighty paintings of Japanese children ranging from 4 to 9 years old are exhibited, depicting life and nature of Toyama prefecture.This exhibition is organized in response to the participation of Bahraini children’s paintings in the art exhibition held last year in Toyama prefecture, Japan in cooperation with Ms. Kalthoom Amin, Toyama Honorary Friendship Envoy and the Sulman Cultural Center. H.E. Mr. Takeshi KONDO, Ambassador of Japan, visited the Royal University for Women(RUW) on Tuesday 16 th February 2009. H.E. Mr. KONDO discussed with Dr. Mazen Jumah, the president of RUW, and other professors and staff members on cooperation between RUW and Japanese educational institutes. 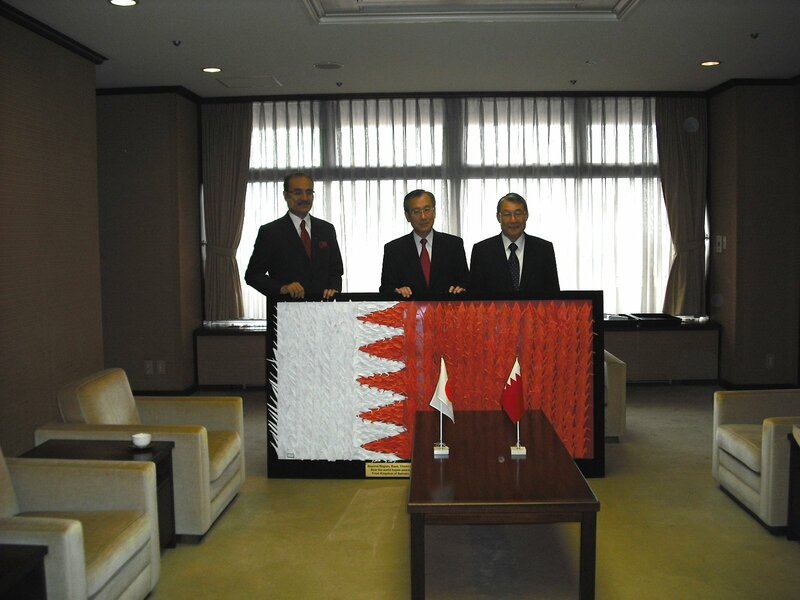 The Project Team of Ruling Parties (Hon.Gen.Nakatani, Hon.Shigeki Sato and Hon.Katsuhito Asano) visited the Kingdom of Bahrain on February 12. They met H.H.Sh.Salman bin Hamad Al Khalifa,Crown Prince and Deputy Supreme Commander, H.E.Sh Khalifa bin Ahmed Al Kahlifa, Commander in Chief of Bahrain Defense Force, H.E.Sh.Khalid bin Ahmed Al Kahlifa,Minister of Foreign Affairs and also visited the Headquarters of Combined Maritime Forces, and discussed counter piracy measures. Dr. Shimada, President of Chiba University of Commerce, gave lectures entitled “Japanese Economic Development : Implications for Development Strategies” He hold two lectures, one for students, professors at Arabian Gulf University on 8 th, the other for government officials and businessmen at Movenpick Hotel on 9 th. Both lecture were great success with a lot of questions from the audience. 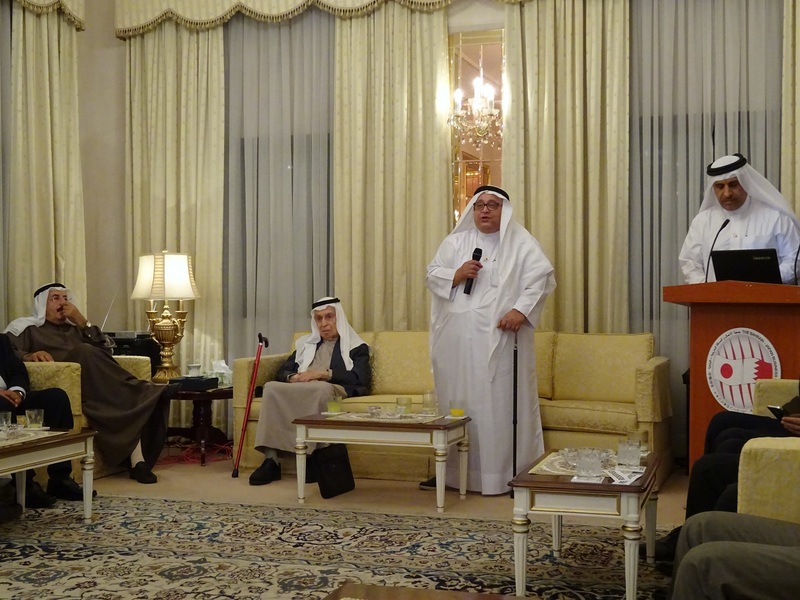 On the 9 th evening, Mr. Mubarak Kanoo, President of Bahrain Japan Friendship Society, invited Dr. Shimada and society members to his residence to hold presentation and dinner reception. H.E. 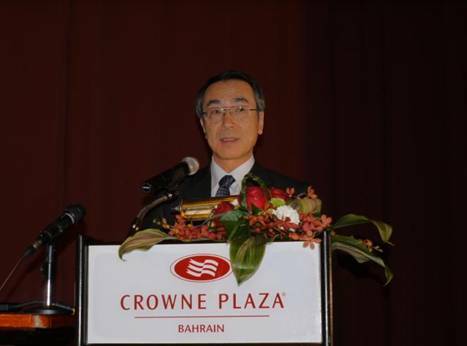 Mr. Takeshi Kondo, Ambassador of Japan to the Kingdom of Bahrain and H.E. Dr. Khalil Bin Ebrahim Hassan, Ambassador of the Kingdom of Bahrain to Japan paid a visit to the Mayor of Hiroshima City, Mr. Tadatoshi Akiba on 5th February, 2009, and presented to him a panel designed by Bahraini children on the 5, February 2009. The panel denoted the flag of the Kingdom of Bahrain in red and white origami (Japanese traditional art of paper folding) cranes symbolizing the hope of the Bahraini youngsters for world peace. 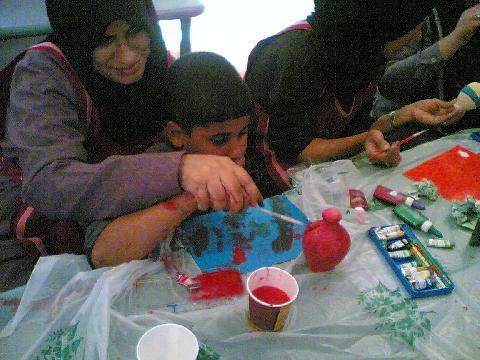 These children were participants in the origami workshop at Youth Innovation Center in cooperation with the Embassy and the alumni of the Ship for World Youth Bahrain in July 2007. During their meeting, the Bahraini Ambassador and Mayor of Hiroshima City agreed to promote bilateral relations between Bahrain and Hiroshima City. H.E. 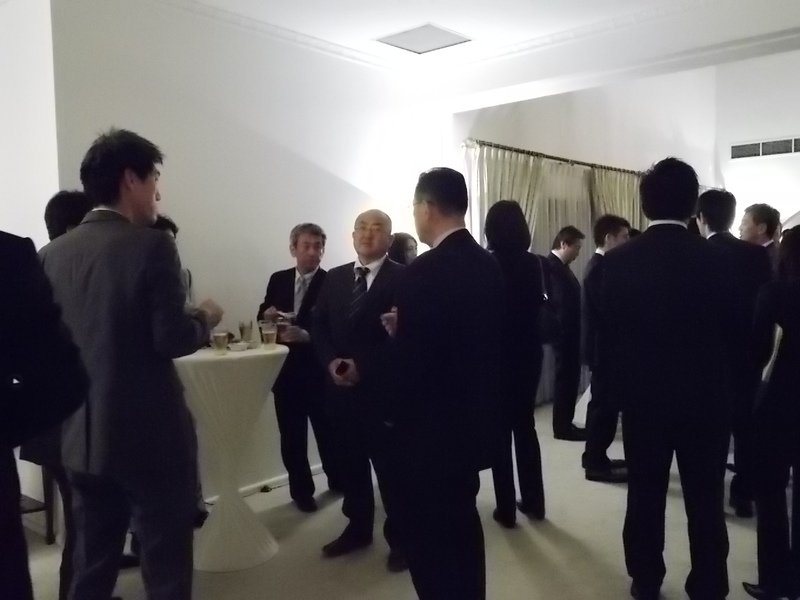 Mr. Takeshi Kondo, Japanese Ambassador held New Year’s Reception at his residence on 10 th January, 2009. 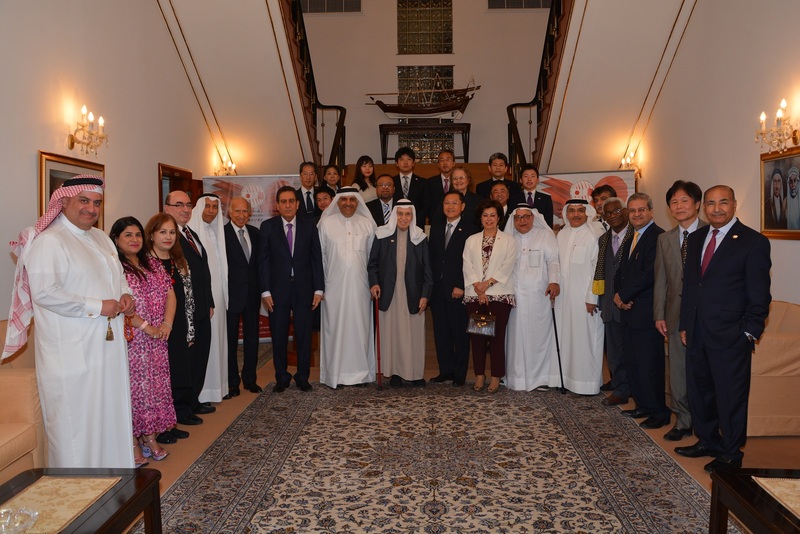 Japanese residents in Bahrain, Bahrainis who studied in Japan, participants of the ship for world youth, JICA trainees, distinguished Bahraini businesspersons who are members of Bahraini Japanese Friendship Society and Bahraini officials were invited. More than 100 attendants celebrated new year. H.E. 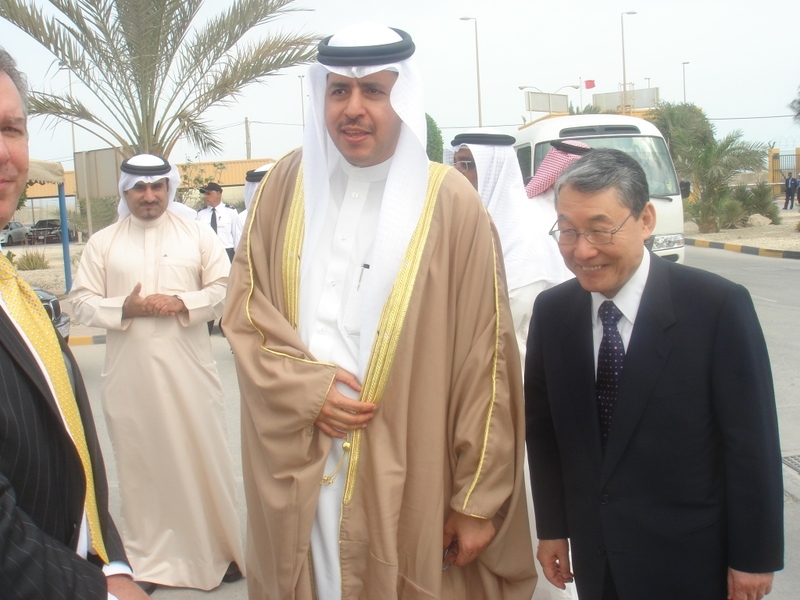 Mr. Takeshi Kondo, Ambassador of Japan to the Kingdom of Bahrain and H.E.Capt. Abdulrahman Mohammed Al-Gaoud, Undersecretary for Civil Aviation Affairs of the Kingdom of Bahrain signed and exchanged their Notes concerning the agreement for air services on December 20, 2008. It is expected that the Bahraini aviation authorities and Japanese airlines will intiate discussions on the development of air services between Japan and Bahrain. December 12th to 14th, saw the occasion of the Regional Security Summit, 5th "Manama Dialogue" at the Ritz Carlton Hotel and Spa under the organization of IISS (the International Institute for Strategic Studies). H.E. 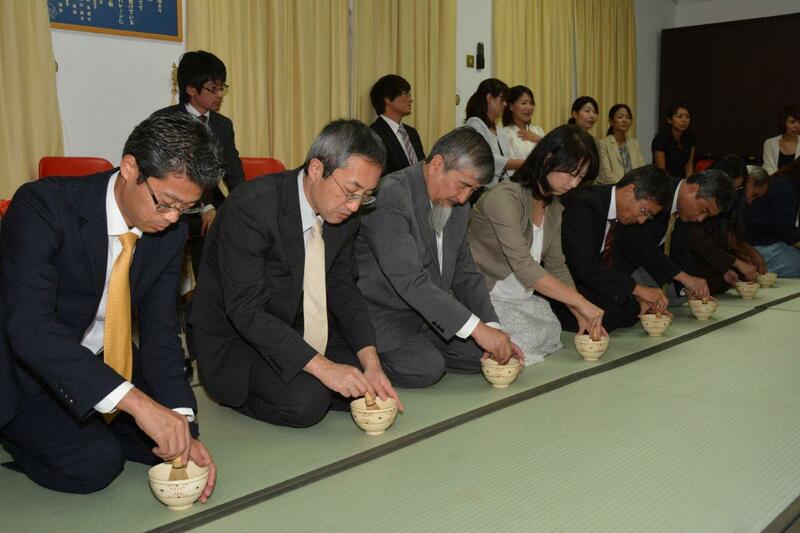 Mr. Hayashi, member of Japan's House of Councilors and Former Minister of Defense, led the Japanese delegation. His statements were delivered in the 2nd plenary session held on December 13th. Also, on the same day, a separate meeting wad held between H.E. Mr. Hayashi and H.H. Shaikh Salman bin Hamad Al Khalifa, Crown prince and deputy supreme commander, and H.E Shaikh Khalid bin Ahmed Al Khalifa, minister of foreign affairs, on the sidelines of the dialogue. H.E Mr. Takeshi Kondo, ambassador of Japan, was also present at the meeting of Mr. Hayashi with the crown prince and the foreign minister. I am honored to have the opportunity to address you today at the 5th IISS Manama dialogue as the head of the Japanese delegation. In a world which is undergoing fast globalization , we face not only the conventional kinds of conflict among countries, but also various new kinds of threat: international terrorism, proliferation of mass destruction weapons, piracy, trans-national organised crime such as drugs and money laundering and unpredictable large-scale natural disasters. In addressing these increasingly diversified and complicated threats, international coordination is absolutely indispensable. This was the consensus among the countries who participated in the two major meetings Japan hosted this year, the Tokyo International Conference for African Development (TICAD) IV meeting in Yokohama and the G8 Summit. What we need now is for each country and region to recognise the various threats and to work in a concerted manner to mitigate risks which might lead to the instability of the whole region. The Middle East has been the main supplier of energy resources to the world. At the same time, the region has experienced turmoil and a number of conflicts with implications for the peace and stability of the world. Looking back on the past 20 years we can easily recall several conflicts. The international community has been seeking the stability of the region through the prevention of conflict, peace building and reconstruction of the affected region, extending support to sustain democratically elected governments. In this context we really welcome the positive attitude of the Kingdom of Bahrain in taking initiatives to set up a regional organisation in which all countries in the Middle East and North Africa are members without exception. For the sake of seeking permanent solution to these conflicts, people need to be given hope for the future through economic development and human resources development to understand what kind of rules the reconciliation of parties will bring about. This is really essential to mitigate the risk of instability and maintain stability. In its efforts to play an active role for international peace under the constraints of its constitution, Japan has accumulated its experiences in the Middle East region. Immediately after the end of the Gulf War, Japan dispatched minesweeper vessels from the Maritime Self Defence Force (SDF). Following this, Japan enacted the PKO law and sent the Self Defence Force to the Golan Heights from 1996. At present, Maritime Self Defence Force vessels are in the Indian Ocean carrying on with its duty in the global fight against terrorism by refuelling the coalition vessels, as Secretary Gates noted. I am wearing this white band here to pray for the safety of the SDF guys which I started as a Minister. On Friday, just before I left Japan, our parliament just passed the bill to continue the refuelling support activities in the Indian Ocean using the two thirds supermajority to overcome the rejection by the Upper House, which is controlled by the opposition party. In Iraq, Japan’s Ground Self Defence Force implemented humanitarian reconstruction assistance in Samawa. After the Ground Self Defence Force completed its duty, the Air Self Defence Force continued their air lift duties. Our government has decided to terminate the mission of the Air Self Defence Force by the end of this month. The process was started when I was a Minister, in September. We are confident that these contributions have been highly regarded by the international community. Japan is determined to continue our contribution to the stability of the region as a responsible member of the international community. Earlier I mentioned the importance of economic development as a key to stability. On this front, Japan has been striving to make the most effective use of official development aids (ODAs) and every tool at its disposal to assist the nations and regions of the world, thus giving people brighter prospects for the future. One example of this is the corridor of peace and prosperity in initiative. The initiative is created on the basis of promoting regional cooperation and prosperity by joining our resources for the Palestinians in the West Bank with their neighbours. Japan has also been extending cooperation to Iraq and Afghanistan to improve their educational systems, develop their human resources and help women to live full and independent lives. Beyond these efforts, we are faced with unprecedented challenges today. First is the financial crisis. We do believe in dealing properly with the current crisis. It is important to keep in mind that no single region or country can secure long-standing benefit on its own. We must work together in a firm and courageous manner in securing the common interest of human beings, which extend far beyond petty differences, and we must avoid repetition of the nightmare of the Great Depression 80 years ago. This is the underlying view when Mr Aso, the Prime Minister of Japan, announced at the G20 summit meeting the readiness to extend $100 billion in response to the urgent needs of the emerging economies, as well as medium and small-sized countries. On the other hand, the current economic turmoil brought about the rapid decrease in oil price, shrinking national income in the Middle East, cooling down foreign investment, devaluation of the dollar due to the dollar peg of GCC currencies, and the stock price decline. Thus it is gradually affecting the economies of the GCC region. Due to the social reality that the oil-producing GCC countries depend on large numbers of expatriate workers and simultaneously suffer high unemployment of the young generation, diversification of the economy and promotion of employment are priority issues for these countries. Keeping this in mind, Japan has been building the so-called multi-layered relationships with GCC countries, cooperating with these countries in such fields as education, human resource development and diversification of industries. I recognise that GCC countries are shifting their direction towards earning hard currency by oil export while satisfying their domestic energy needs by new energy development and nuclear energy, as oil is a limited natural resource. Japan recognises that the peaceful use of nuclear energy is the right of every country. We intend to promote peaceful atomic cooperation under the condition of securing the three Ss: security, safety and safeguard. Second is the serious issue of piracy. Around 90% of the crude oil which Japan imports is supplied by oil-producing in the Gulf region transported by tankers through the Strait of Hormuz. Thus the security of the Gulf and the surrounding waters is critical to energy security for us. Japan has great concerns about the instance of pirates flagrantly operating off the coast of Somalia and in the Gulf of Aden. At the moment, the ruling parties of Japan, the Liberal Democratic Party (LDP), together with our friend and partner the Komeito party, are intensely discussing the issues, with some advocating the preparation of a standing law to enable Japan to tackle piracy cases. The international community should take joint actions to address the issues in an effective and quick manner. Japan continues to make efforts to strengthen the capacity of the coastal guards off of the countries concerned. Before closing, let me mention that we are waiting to observe the changes in, as well as the continuation of, policies of the coming US administration on the Middle East around issues such as the Middle East peace talks, Iraq, Afghanistan and Iran’s nuclear position. We are also watching carefully the judgements of the people of these countries here through the results of the general election in Israel next February, ｒ eferendum in Iraq next July, and the presidential election in Iran next June. Japan is becoming a non-permanent member of the Security Council of the United Nations from the beginning of next year, and we will tackle important issues on the international arena for the sake of securing the peace and stability of the world. Thank you for your attention. On behalf of the Government and people of Japan, I have the great honour and pleasure to present my warmest congratulations to H.M. King Hamad bin Isa Al Khalifa; King of the Kingdom of Bahrain, H.H. Shaikh Khalifa bin Salman Al Khalifa; the Prime Minister, H.H. Shaikh Salman bin Hamad Al Khalifa; Crown Prince and Deputy Supreme Commander, the Government and people of Bahrain on this auspicious occasion of the National Day of Bahrain. I would like to reiterate my heartfelt respects to the important role which the Kingdom of Bahrain plays in maintaining security and stability in the region under the wise leadership of H.M. the King. 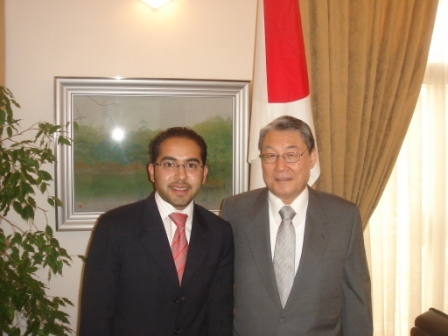 The year of 2008 is very special and significant for Bahrain and also Japan. I am sure that this year will be remembered as a landmark in the long history of our bilateral relations. Japan was fortunate enough last October to be able to welcome H.H. 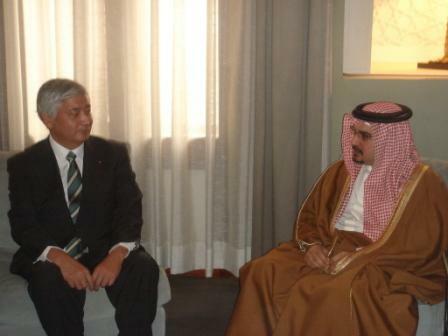 Shaikh Salman bin Hamad Al Khalifa, Crown Prince and Deputy Supreme Commander in Tokyo. It was the first official visit by the Crown Prince of the Kingdom of Bahrain and we were glad it was realized 14 years after Japanese Crown Prince and Princess had visited this country in 1994. H.H. 's visit was immensely successful. 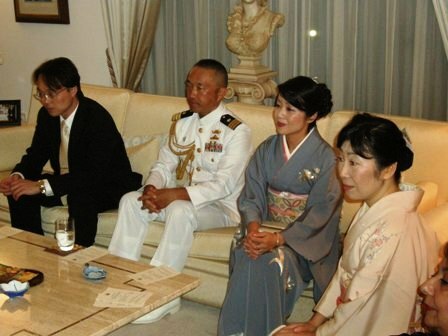 The constructive, fruitful and encouraging talks conducted between His Highness and H.M. the Japanese Emperor, H.I.H. Crown Prince Naruhito and Crown Princess Masako, the Prime Minister, other ministers and business leaders, and the significant and remarkable speech delivered by His Highness at Waseda University will further boost the relations in various domains, deepen the ties existing between the Royal Families of Bahrain and Japan, and open new horizons of cooperation between Governments and private sectors of both countries. A bilateral Economic Coordinating Committee has as a result been set up between the two Governments, and Japanese companies are more interested in this country as a gateway to the region. 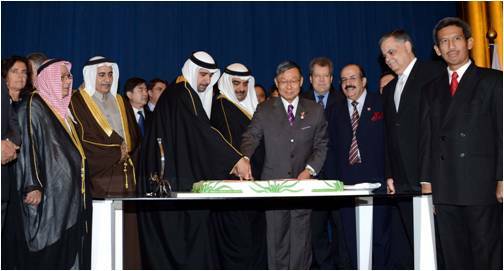 Another landmark event was the inauguration of Bahrain-Japan Friendship Society. Thanks to the efforts of the prominent businessmen, it finally became the reality more than a decade after it was conceived. 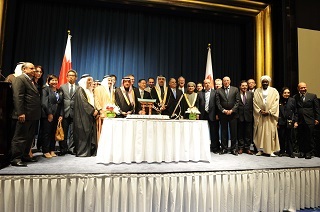 I am sure that our excellent relationship rests on firm foundations, but I am keen to further promote the bonds between our countries, through the exchange of visits of prominent government officials, parliamentarians, businessmen and thinkers of both countries, and the organization of various events in both countries, with the gracious help and support of the Japan-Bahrain Friendship Society and the Japan-Bahrain Parliamentary Friendship Association. I also avail myself of this opportunity to extend to the leadership of Bahrain my most sincere congratulations on inauguration of the Economic Vision 2030 by H.M. King Hamad bin Isa Al Khalifa, King of the Kingdom of Bahrain. I would like to express my heartfelt admiration and profound respect to the Comprehensive Economic Vision, which represents a pillar of the Royal Reform Project of H.M. the King. I sincerely wish every success to the Economic Vision for defining a future outlook, a guideline towards economic development and sincere work to allow the private sector to take over the reins of the economy, with a leaner and more efficient civil service for providing top quality public services, and for attracting foreign investments and creating an economy independent of oil revenues. The farsighted visions and policy of H.M. the King at regional and international arenas would turn the Kingdom of Bahrain into an oasis for security and stability and a haven of creative co-existence. I therefore have the pleasure to join the world in congratulating Bahrain's leadership, Government and people and in praising their achievements and the continuous and tireless efforts for ensuring a prosperous future to the people of this free and beautiful country. Hoping that the new era will usher enhanced co-operation between Japan and the Kingdom of Bahrain. On behalf of all members of my Embassy and the Japanese Community in Bahrain, my wife and I would like to welcome you all to this reception. 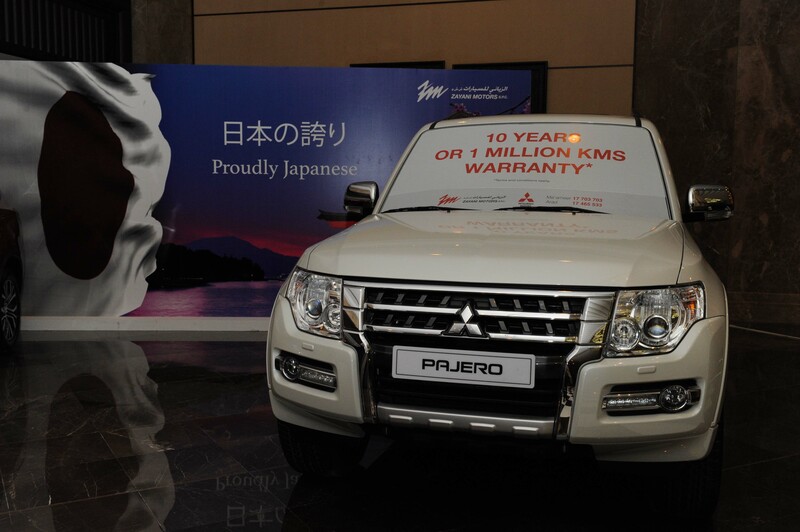 Tonight is very special for us at the Japanese Embassy and the Japanese Community in Bahrain . Here, we celebrate this day the 75 th Birthday of His Majesty the Emperor of Japan, and we are extremely happy to be able to share this delightful occasion with so many friends. Thank you very much for being with us. I am sure that this year, 2008, will be remembered as a landmark in the long history of our bilateral relations. Japan was fortunate enough this October to welcome H.H. Shaikh Salman bin Hamad Al Khalifa, Crown Prince of the Kingdom of Bahrain, in Tokyo. It was the first official visit by the Crown Prince of the Kingdom of Bahrain and we were glad it was finally realized 14 years after Japanese Crown Prince and Princess had visited this country in 1994. H.H. 's visit was immensely successful. H.H. charmed every body he met. H.H. also impressed all the audience by the memorable speech he delivered at Waseda, one of the most renowned universities in Japan. A bilateral Economic Committee was set up between two Governments, and Japanese companies are more interested in this country as a gateway to the region. 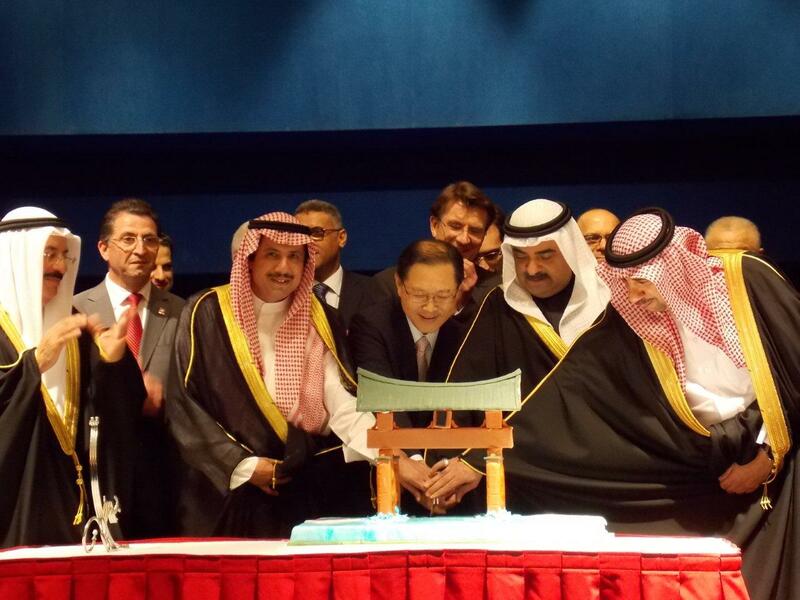 Another landmark event was the inauguration of Bahrain-Japan Friendship Society. This September, thanks to the efforts of prominent business leaders, it finally became a reality more than a decade after it was conceived. I know they are already planning a variety of events, including a trip to Japan. I hope all of you will join us as active members of the Society. With your participation, our bilateral relations will be further enriched. And now, before closing, I have to mention briefly about the challenges we commonly face. It is true that Bahrain and Japan are the countries relatively less affected by the current financial turmoil, but we all know that respectively we have certain problems to solve and responsibilities to assume. As the peace and prosperity of this region represent an integral part of Japan's national interest, and as Bahrain is playing a unique role as a balancer for the region and a precursor of the reforms for the future, we, Bahrain and Japan are in the same boat. Let us continue to move on together to make this world a better place. That is why our bilateral relationship is so precious . I am indeed happy and proud to represent my country at the time so important and in the country I love so much . H.E.Mr.Takeshi KONDO, Ambassador of Japan to the Kingdom of Bahrain,visited the Down Syndrome Care Center on Monday, November 24, 2008. H.E.Mr.KONDO was pleased to meet Dr. Mohammed Al Mannai, Director of Down Syndrome Care Center, who familiarized him on activities of the center and took him on a tour inside the Center. Bahrain Down Syndrome Society was established in 1998, and the Care Center has started its work in 2001 as the first specialized educational institute for the children with down syndrome in Bahrain. The Ambassador was impressed by the dedicated services provided at the Center, and extended an invitation to the children of the Center to The Autumn Festival of Japanese Society which will be held on November 28 in Budaya. H.E. Mr. Takeshi Kondo, Ambassador of Japan, visited Alia for Early Intervention, and met Sh.Rania bint Ali Al Khalifa, Secretary-General, and Ms. Somaiya Hussain, Vice President of the Alia. The Alia centre was created in November 2004 by the Bahrain Society for Children with Behavior and Communication Disorders. Alia offers evaluation, early intervention services and case management to eligible children and their families. This school is run as a non-profit organization. There are school fees but these are kept to the absolute minimum, thereby making the center available to all. After only two years of operation, Alia for Early Intervention was able to mainstream four children into private schools with their typical peers. The following year, three more children joined mainstream education. Being extremely impressed by the dedicated services at the school, the Ambassador extended an invitation to the school children of Alia to attend The Autumn Festival of the Japanese Society which will be held on November 28 in Budaiya. Sh. Rania and Ms. Somaiya expressed their hope to promote exchange visits with the Japanese community through other similar occasions, like Alia’s Annual Carnival (i.e. Festival) in February. H.E. 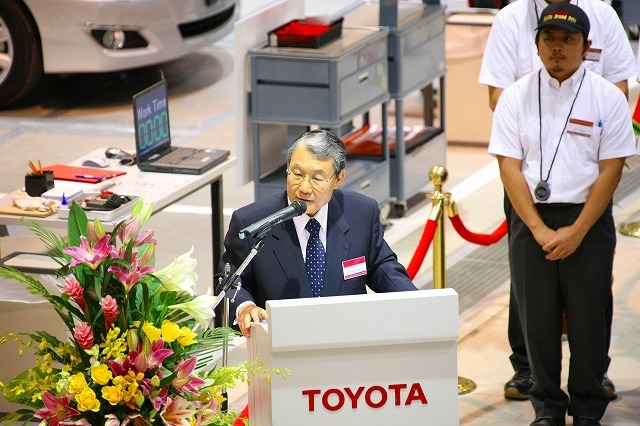 Mr. Takeshi Kondo, Japanese Ambassador, attended the 12 th Toyota Middle East Technician Skills Grand Prix, which was held at Toyota Training Center in Sitra on 17 th November, 2008. The event, held under the patronage of Labour Minister Dr. Majeed Al Alawi, aims to determine the best Toyota technician in the region by inviting national winners to a regional event to compete for the title of Middle East Grand Champion. 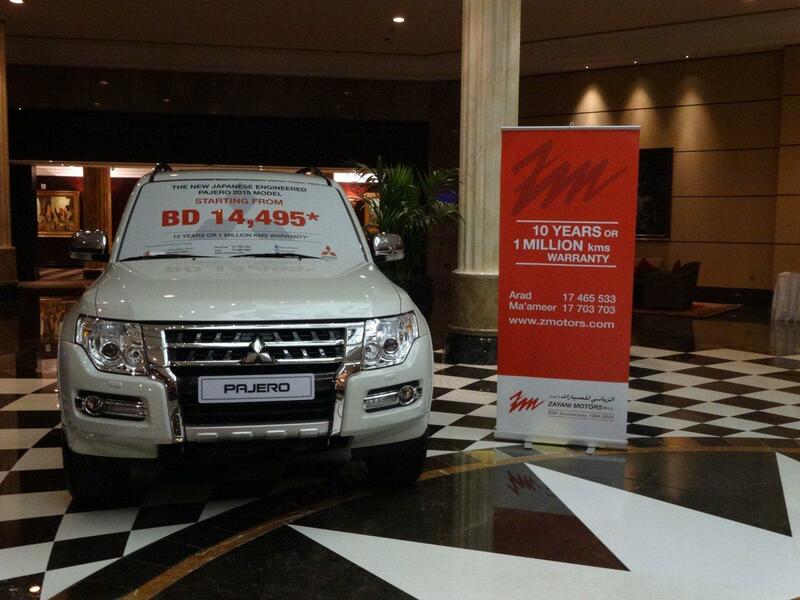 This year’s title was won by Mr. Ammunny Pradeep from Kuwait. First of all, I would like to thank Organizers for the kind invitation, and congratulate all the contestants for being the best of the best. Last year I was here for the first time and was impressed by the contestants who displayed high morale , excellent skills and commitment to the highest customer satisfaction. I also was inspired by their "can do" spirit. And there, I thought, lay the secret of Toyota's success. Toyota is now the most well-known company, but, actually is rather new in the history of motor industry. When Toyota started to sell passenger cars in the US half a century ago, many people thought that it would not work, but Toyota worked very hard and made a successful entry to the U.S. market. In the seventies, when California imposed very strict environmental regulations, most auto makers thought it was too tough to comply with, but Toyota had a different idea and instead, invested new technologies and designs to go with the new rules. Thus, they succeeded in capturing larger market shares not only in the US but also globally. 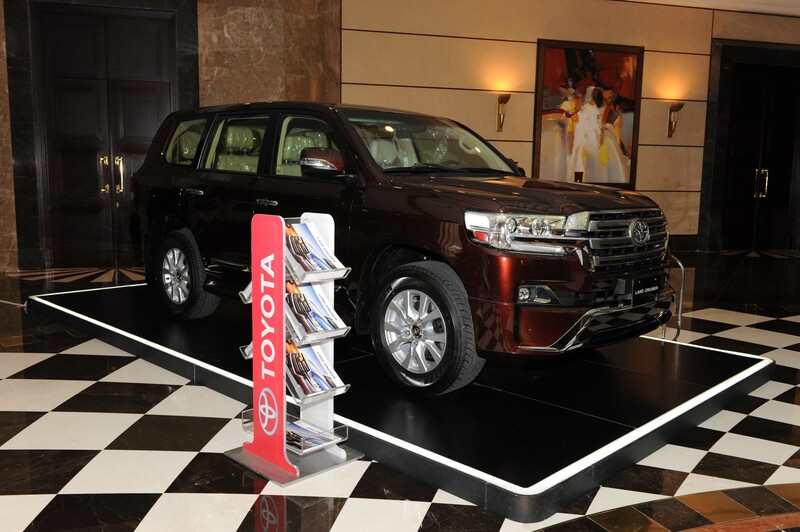 Toyota is also the treasure house of human resources development and training. Toyota exists in different cultures and environments, and is an example for the integration that could be achieved and the balance that could be established. It is most gratifying that the Toyota Training Centre is playing the significant role in Bahrain in providing the local industry with highly trained technicians. Such a role is greatly appreciated in all the Middle Eastern countries and, surely in Bahrain goes in line with the aims of the Economic Vision 2030 recently launched by HM King Hamad bin Isa Al Khalifa, King of the Kingdom of Bahrain. 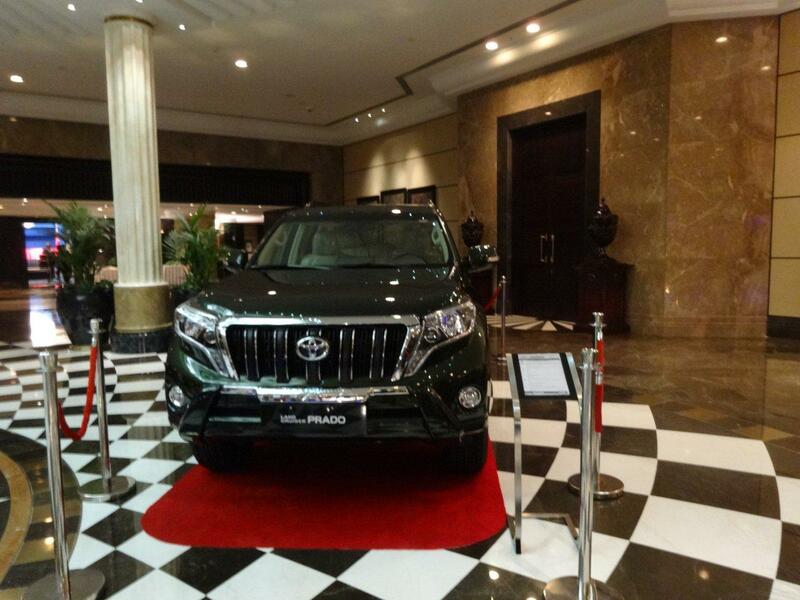 Today's contestants are the embodiment of such Toyota's achievements and spirit. I look forward to being inspired again today by their "can do" spirit and commitment to the excellence. H.E. 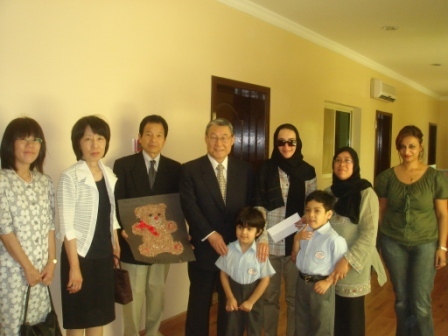 Mr. Takeshi KONDO, Ambassador of Japan to the Kingdom of Bahrain, visited the Hope Institute for Special Education on Wednesday, 12 th November 2008. H.E. Mr. Kondo was very pleased to meet Shaikha Hind bint Salman Al Khalifa, President of Mother & Child Welfare Society, Ms. Mahfooza Al Zayani, Vice Chairwoman of the Society, Ms. Badriya Yousif Slais, Director of the Institute, Ms. Shaikha Abdulla Issa Alhussaini, Assistant Director of the Institute, and other teaching staffs, who briefed him on activities of the Institute and took him on a tour inside the Institute. The Ambassador was very impressed by the special education and care provided to the students at the Institute.